Carrom was originated in India in the 18th century. Apart from having a good sense of angles, it requires an excellent concentration and precision. Carrom is played on a polished square board with small circular wooden pieces known as carrom men and a striker made up of hard plastic. There are 18 carrom men in a total of which nine are white, and nine are black. One carrom men is red or pink which is the queen. The primary objective of this game is to flicking of your fingers by using a striker and putting the carrom men in one of the four corner pockets. Carrom is about striking carrom men into the pockets. The queen is one of the most crucial carrom men of this game which consists of maximum points if you score it before the opponent. Carrom is one of the most famous indoor games which has gained much popularity in the middle east and south east countries. In south Asia, many cafes and clubs hold regular tournaments and they are played by people of all age groups. Even after playing this game consistently for a couple of hours, you cannot get bored with this fun game. The only thing that can be a bit uncomfortable for you is for your fingers; they might get hurt after playing it for a while. Unlike any other indoor game, it can be played in singles as well as doubles. Mostly all the indoor games are played in singles, for example, chess. Minimum 2 and maximum of 4 people can play this game. It is one of the trick shots which is used to hit a carrom men out of your competitors way or into a pocket. This shot is played by hitting a striker in such a way that it pushes the carrom men in the opposite direction of the side that was hit and will consequently make it difficult for the opponent to score that carrom men into a pocket. Or you can either play a shot in a way that it directly goes straight to your pocket, if it does not even then the opponent cannot score that carrom men into his pocket. It is a shot that is played to be on a safer side. For example- if you flick the striker in the right direction, it will go towards left after it is struck. This tricky shot is played at the beginning of the game when all the carrom men are placed in the center of the board. 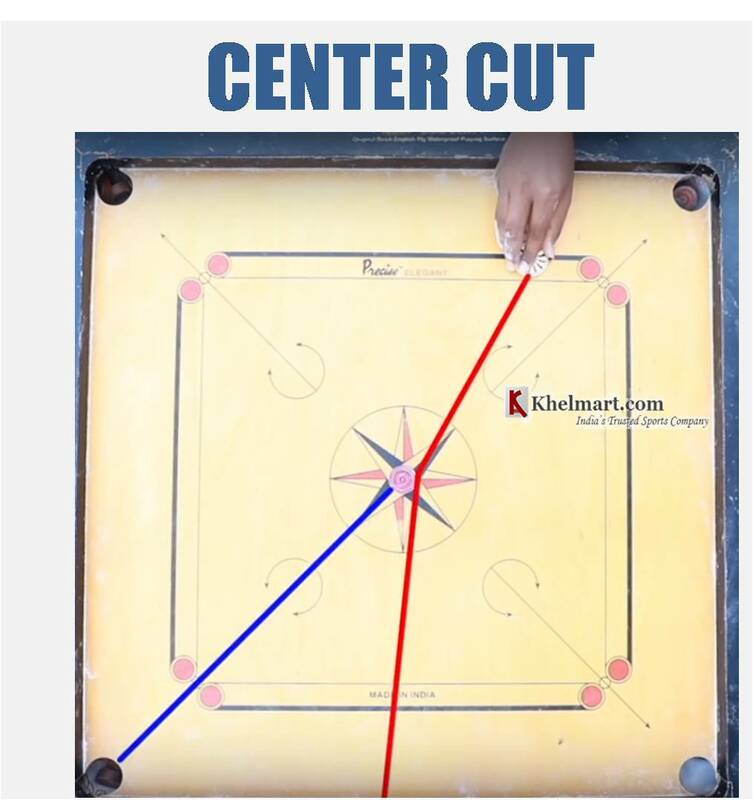 You have to hit 2 carrom mens concurrently by hitting the striker to the space seen between the two carromens. The two carromens you will be hitting would be adjacent to each other, so by touching one another, they should move in opposite directions, and you can score two carromens in 2 different pockets at the same time in the first shot of the game. This shot is played when there is a need to cut a carrom men to a different direction and simultaneously in the same chance, you score a carrom men into another pocket. It is done to make the carrom men easy to score in your next shot. This trick shot is played when your finger starts to hurt after hitting the disk for quite a while. This short results in a stronger hit if it is played precisely. It becomes essential to use when you are playing carrom from a couple of hours, as there are no rules that you can hit the striker only with one finger, so you have to use your thumb in that case. Form a circle by using your index finger and your thumb and shot the carrom men by moving your thumb towards the striker. It is one of the best tricks if you are playing this game in doubles. When you are playing a doubles game, the strategy is a key, and it is comparatively difficult to play in doubles than in singles as you will not know what is coming next. This trick is solely based on teamwork as it consists of hitting a carrom men close to a pocket and when it is going to be your partners turn, he will put it into the pocket effortlessly. But this trick should not be used persistently as it will make this strategy evident to your opponents. If a carrom men is blocking your punch to another one, this trick is used to pocket two carrom mens at a single shot. You need to target the carrom men which can hit the other one to hit them into the pockets in a straight line path. This tricky shot is for advanced players as it requires a bit of experience and knowledge. In this shot, you need to hit the striker in a direction, so that it touches three different sides of the board in such a way that striker hits the carrom men straight into the pocket of your side. 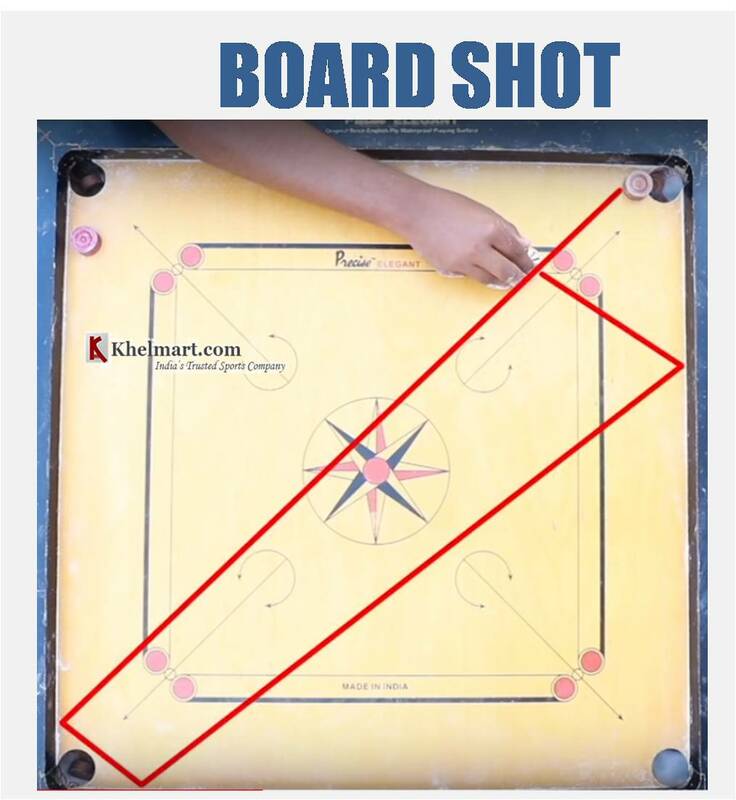 This shot is played when a carrom men is placed in the center of the board. 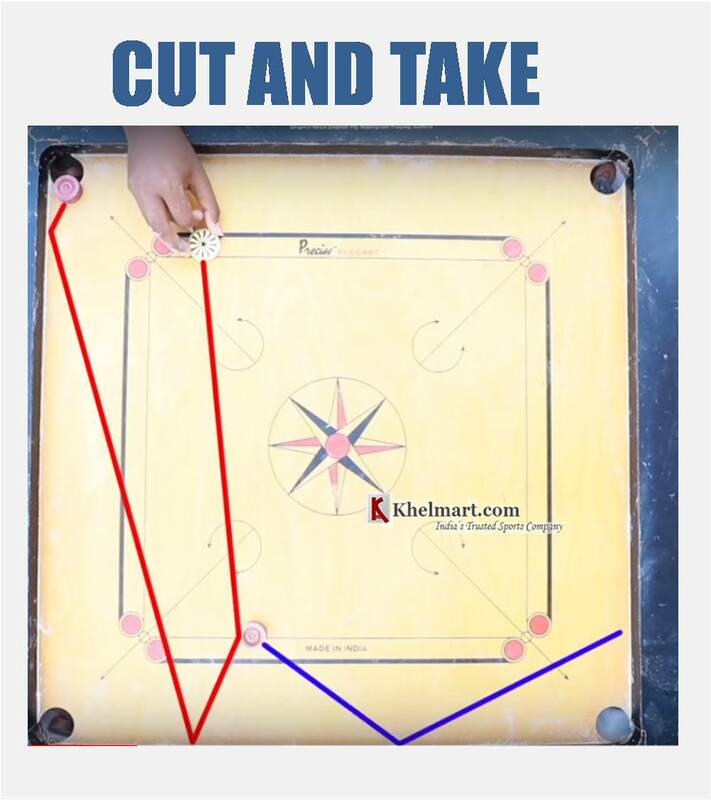 You set your fingers on the striker and flick of the fingers to hit the carrom men to the other side of the pocket of which the striker is placed. For example- if you are playing this shot from the left side, then you will play the cut shot towards the right side and score it in the right pocket. It is the most common tricky shot as almost everyone who plays this game is aware of this shot. 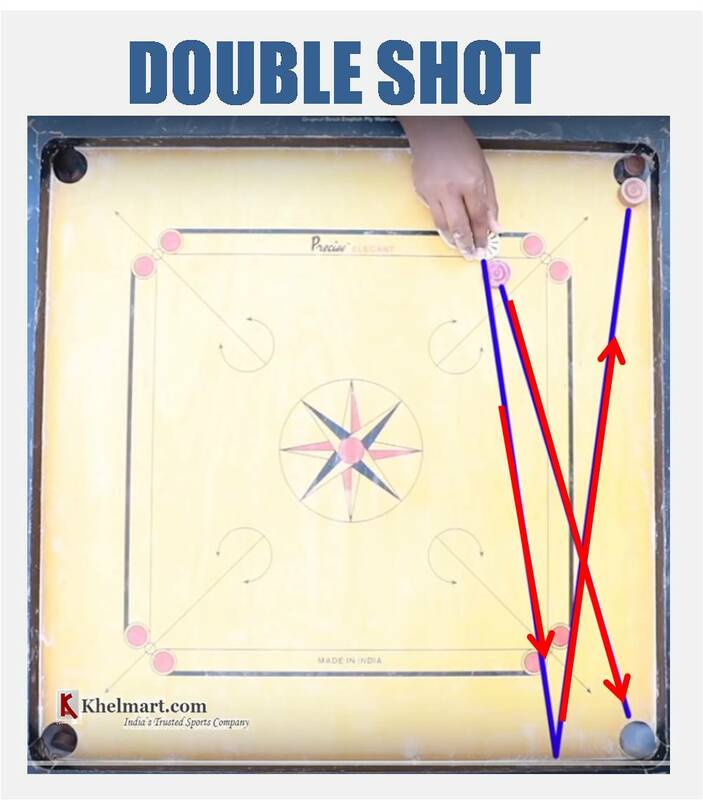 The double shot is when a carrom men is placed anywhere in the center or close to the center of the board. It cannot be played when the carrom men is at the corner of the board. It is because the striker hits the carrom men on to the opposite direction of the board, and after the collision, it comes back to the pocket of your side. 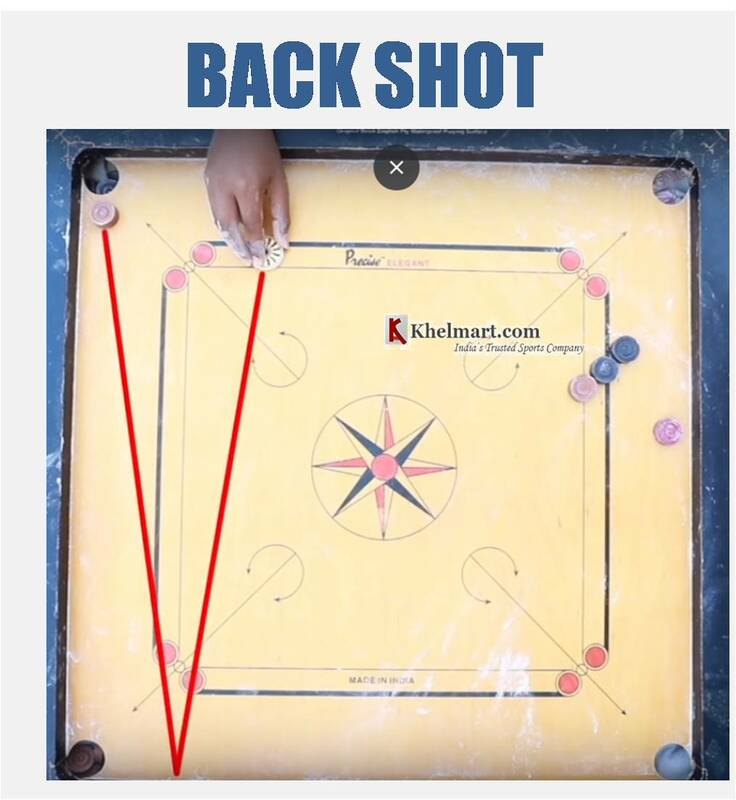 When the carrom men is place``d near to the pocket of your side from where you are playing and setting the striker, as per the rules, you cannot hit the striker directly at the back. This shot is played at this moment when you want to score the carrom men into the pocket of your side by hitting the striker quite hard at the extreme opposite which comes back and consequently puts the carrom men in the hole. a) Keep your hand steady on the board with the edge/base of your palm or fingers or thumb from which you are going to strike. This will ensure that the striker is not pushed and is flicked the right way in which it is required. b) You need to make sure that your striking finger is close enough to the striker; if possible touching it would be great. This will drive the striker in a way without hurting your finger. It will take intensive care of your fingers. If your finger or thumb is hitting the striker from a distance, then you might end up hurting your nails and subsequently your fingers. As carrom board is a game full of fun, so the rules should be kept to a minimum. In previous times, there used to be no written rules at all, and all this was handed down by word of mouth. Well, all the games should be played to have sheer fun but same as others, the factor of Competition comes in. Everyone wants to show that they are better than the other person playing in the game. Thus, if you lose the game all the time, then you start losing interest in the game. But, in case you are playing it with a new player who is not too good, you should always bend the little bit rules for your opponents benefit but not for your interest. Always ensure that they know what the rules are so that after the starting the game, there is no confusion and it goes smoothly. Regularly playing board games like Carrom boards has proven to keep mind even more active and focused. This helps people react in a better way to situations which require instant judgment and swiftness. The awareness that is needed in the games benefits people to become more target-oriented in general. So, use these tricks aptly to play well and become more professional in the game which would help you both mentally and physically. This game is exciting just like billiards and chess where remarkable tricks are the main moves to win the game. in recent times, video games, electronic handheld games, and computer software are hitting the market. All sort of board games are being pushed aside at every home. The contemporary games outstrip the traditional board games like carrom board, chess, ludo, etc. Various people dont realize the importance of board games and how they are advantageous to childhood development. These old board games, especially carrom boards which are collecting dust, can be a key to keeping your childs mind more active and healthy. Carrom board helps in entertaining and brings friends and family together by cooperative and competitive gameplay. Thus, carrom board provides much more than only entertainment. In fact, this game beneficially impacts health as well in many aspects for all the age groups. The primary attention and benefits of Carrom is that it provides the parents with an excellent way to spend good time with their children. While playing carrom board, good bonding is also developed between the families. They give a fair chance to all the family members to refresh and relax their minds. It aids in enhancing logical reasoning power in the child. While playing and having fun at the same time, children can also practice skills such as counting, visual perception, reading, and eye-hand coordination. This boosts children to indulge themselves in verbal communication and healthy competitions. People also practice various types of skills while playing carrom board. This carrom board is famous for smooth playing surface and tremendous re-bounce capabilities. GSI has given a strong reinforcement at the back of the board to embellish the flatness and avoid warping. If you want to shop for sports and any games, then GSI is the renowned sports brand to pick from. 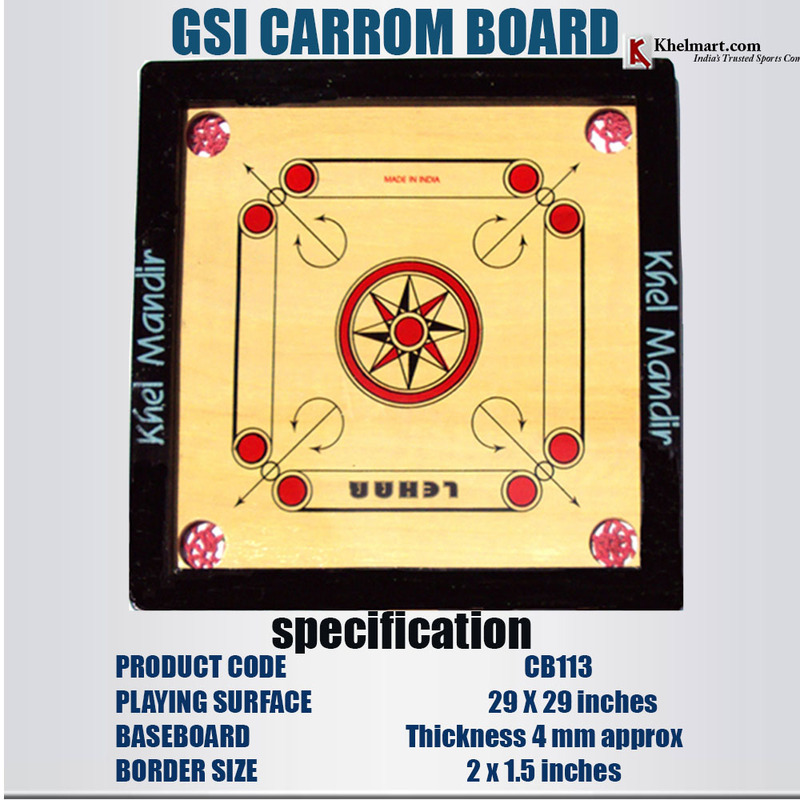 For all types of age groups, GSI carrom boards are pure fun with your friends and family members. These boards are made up of Assam plywood and borders are made up of hardwood (Kikar); its carrom boards are the best indoor/outdoor sport. You can opt for GSI carrom boards undoubtedly, as they offer high quality with best prices. Its carrom boards are very durable and complete value for money. Synco champion premium board is designed to suit professional level players. Synco carrom boards are one of the number one carrom boards and gears brand in India. The products of Synco are highly recommended for all professionals of this field for all sort of tournaments and championship purposes. This brand came into eminence five years ago, and since then all the products of this brand have been used for all types of national and state level tournaments. 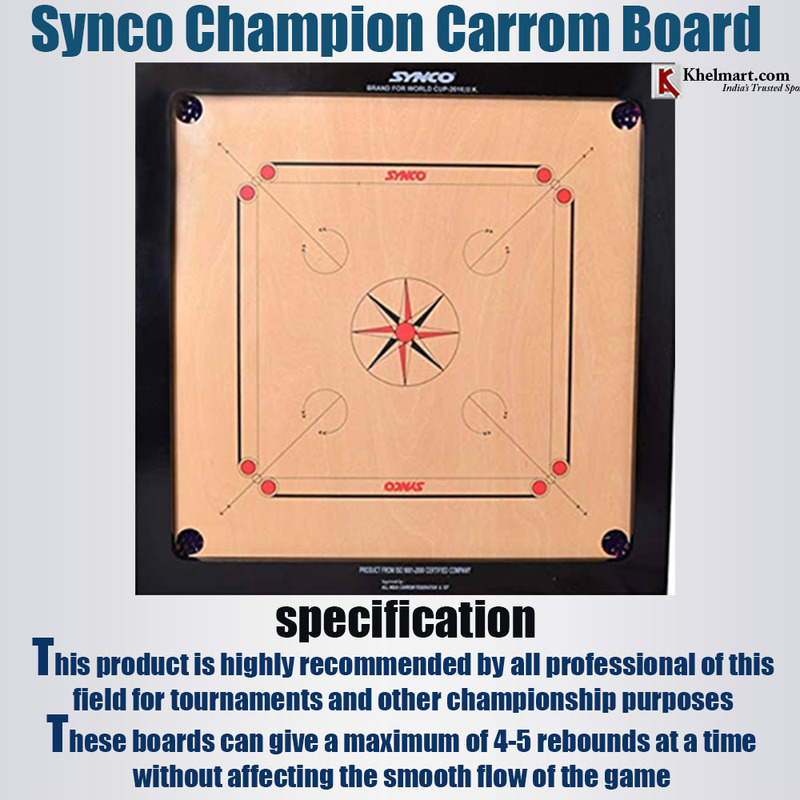 One of the primary reasons why professional carrom players require this range of Synco products is, as they are designed with deep pockets that can hold many coins in it and that too without causing any discomfort to the players in the game. It is a very renowned company that makes carrom boards. The great thing about it is that they offer 11 whites, 11 blacks, and 2 red instead of the regular ones which offer 9 whites, 9 blacks, and 1 red. They are very cost-efficient, and the looks are modern. The prices of this board are very minimal; that means that you would not have to pay high costs to get it. 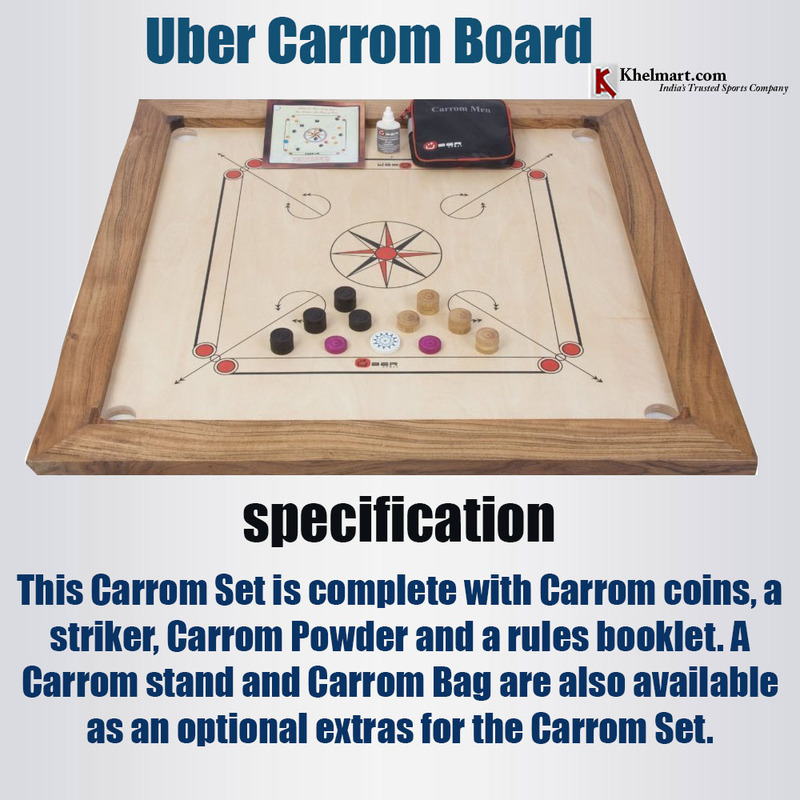 Uber carrom boards are made up of premium quality plywood and come with shiny coins and a smooth striker. You can also purchase these boards with a portable kit box so that you can keep the coins, striker and a powder bottle in it. The range of these carrom boards is usually around Rs. 3,730 to Rs. 17,100. This brand means trust. So, while buying a product of this brand, you are assured that the product is reliable and durable both. Majorly all the international carrom matches are played on Surco Carrom Boards. Surco is a number one producer of superior-class carrom boards. 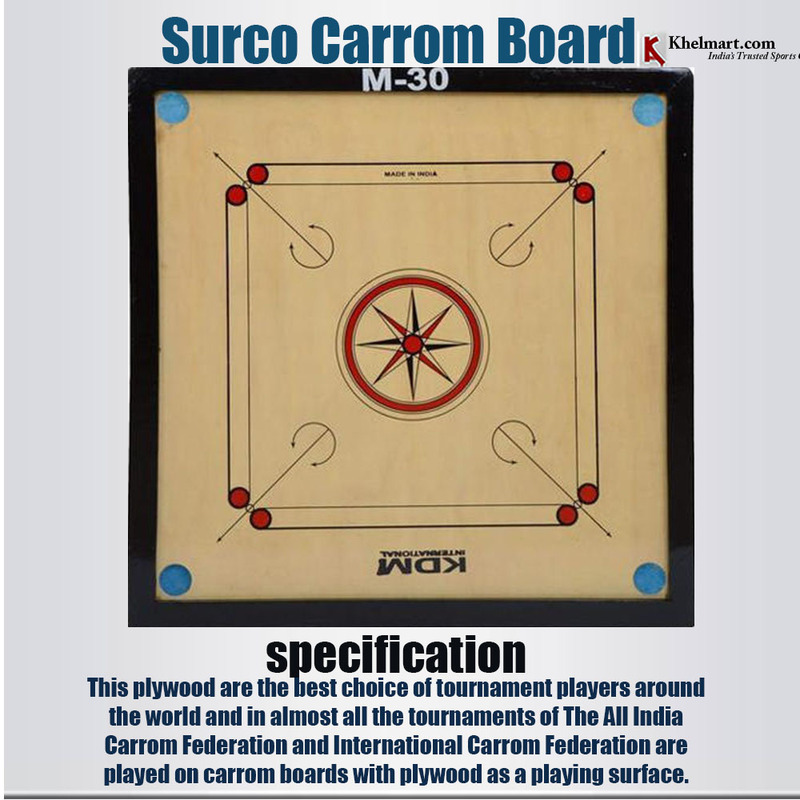 Surco is also recommended by the International Carrom Federation and All-Indian carrom Federation. Its boards are very easy to play for all age group above 12 years of age. Bulldog and Jumbo type of boards are sought more in Surco. The price of these premium-quality carrom boards ranges from Rs. 4,700 to Rs. 54,000. The most crucial thing to remember before buying the carrom board is to check the spelling as it is Surco, but few websites sell duplicate board by the name of Sucro. 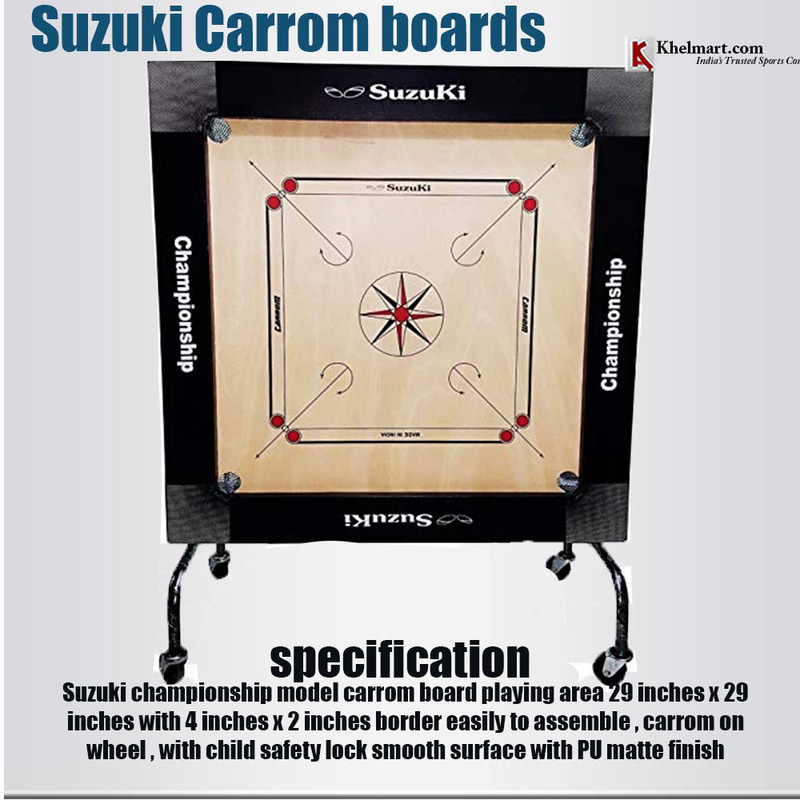 Suzuki is also a leading producer of excellent-quality carrom boards. Suzuki makes boards for casual play and tournament games, both. Their latest release was the championship model which comes along with a wheeled stand. It comes in brown and black colored borders and a complimentary set of coins and a striker. While buying any carrom board, you should always buy a small pouch along to keep the coins and striker safe. The price of the board starts from Rs. 1,700 and goes up to Rs. 9.990. Its carrom boards are made up of excellent quality material which lasts for long, so while thinking of various options while buying a carrom board, this is one of the best choices you should consider. 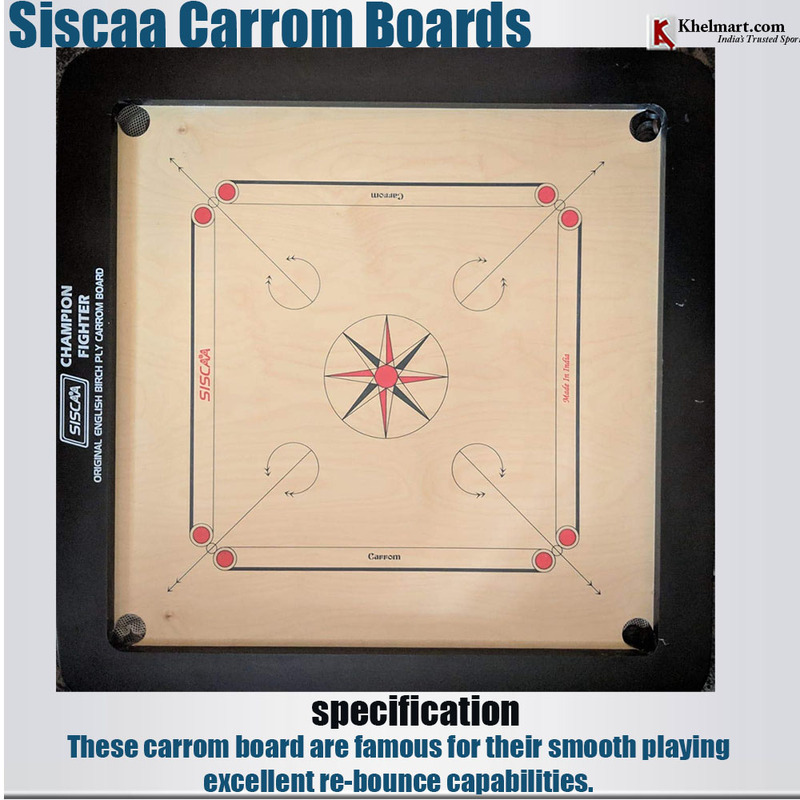 Siscaa is a very famous brand in the industry and also has the approval of carrom federations. Many players around the world have used it and have always given good feedbacks of it. They also ensure that all the products they offer have a great fit and finish throughout. The best thing about these carrom boards is that they are waterproof and scratch proof as well. Many times, carrom boards are bloated because of water, juice or tea spillage which makes them virtually unplayable. In a case like this, you would need to get playing surface changed if possible, or you might have to change the whole board, and it is usually very costly. In those cases, Siscaa boards are the best. This brand is very famous in India and its neighboring countries such as Pakistan, Bangladesh, UAE, Nepal, and Sri Lanka. 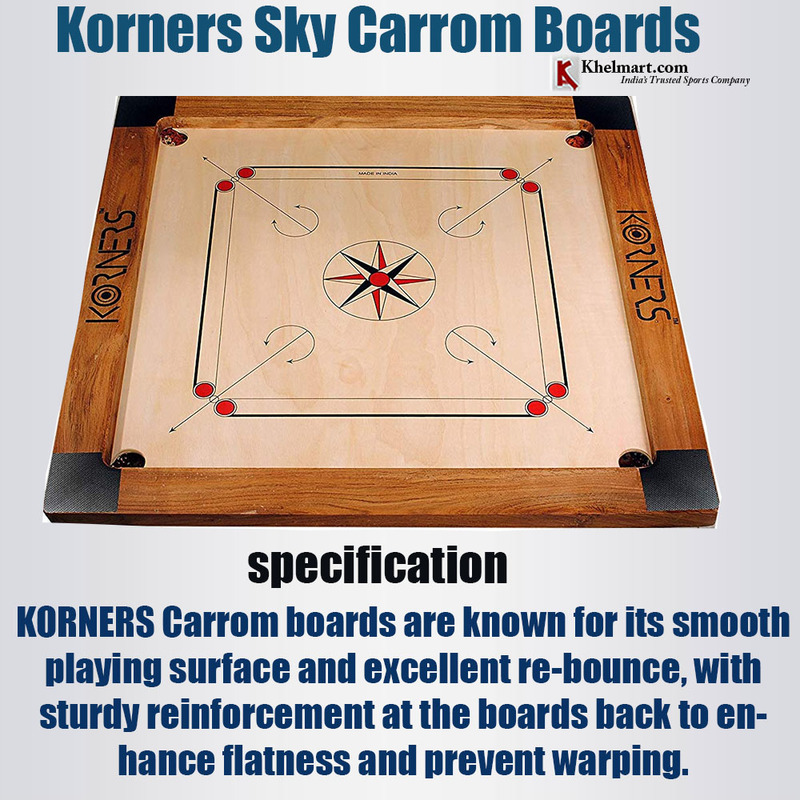 It is one of the top carrom board manufacturers in India. Products of Vinex are sold all over the globe. This company is renowned for its premium quality sports equipment and gears. Vinex was set up in 1957 and has become a significant producer of excellent products and has many outlets globally. Many players purchase its professional carrom boards and powders because of its great designing, nominal prices, and smooth texture. The cost of these boards is usually between Rs. 1000 to Rs. 8000. 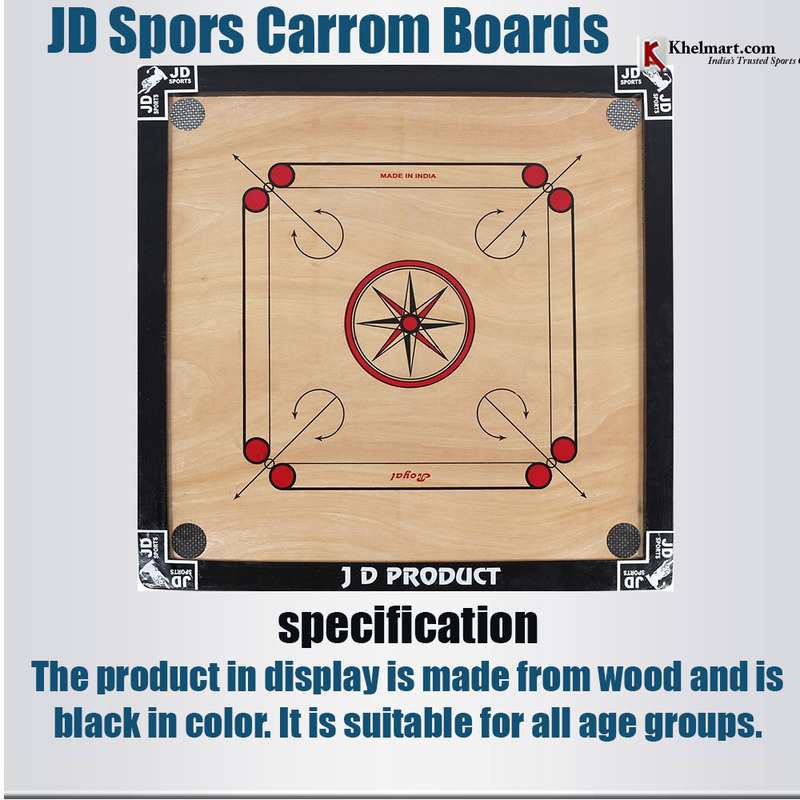 JD sports carrom boards are one of the leading producers of carrom boards. Its products include numerous models of carrom board which are wooden and ich boards. JD also produces boards for young children too. Products of JD come in various sizes such as 32-inch, 42-inch, and 52-inch. Their cost varies from size to size and also from one model to another. The average cost of them is from Rs. 600 to Rs. 3,999. These boards are excellent according to the prices as they are made up of great quality material and also have good reviews as per the people who have used it. So, you can go for it if you are looking for something reasonable with good quality. This brand makes good quality boards. The plywood that is used in making these carrom boards is English birch, but it also depends on the model which you select. It comes in seven different models which are Superb, Jumbo, Bulldog, and Monitor, Amateur, Excel, and Champion. All of these come with their uniqueness and specialties. This brand is well known both nationally and internationally. 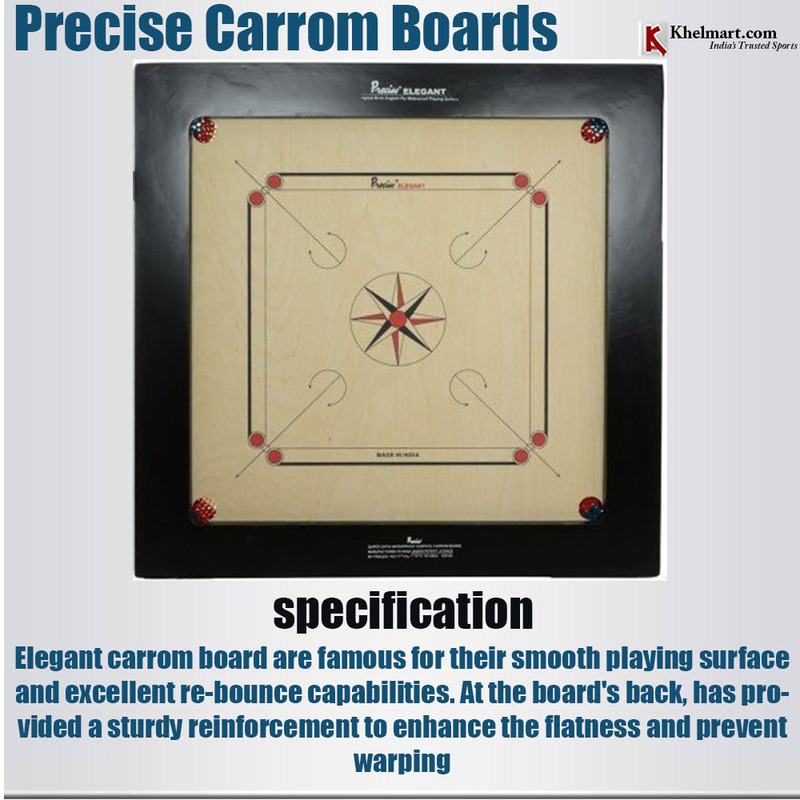 Precise carrom boards have been used in various matches as well. Its boards come in various thickness options as well; more thickness means more money. The great thing about the precise boards is that they come with rebounds. Its carrom boards are one of the most frequently purchased carrom board brands. Stag boards are very cost-efficient and are made up of high-quality material. 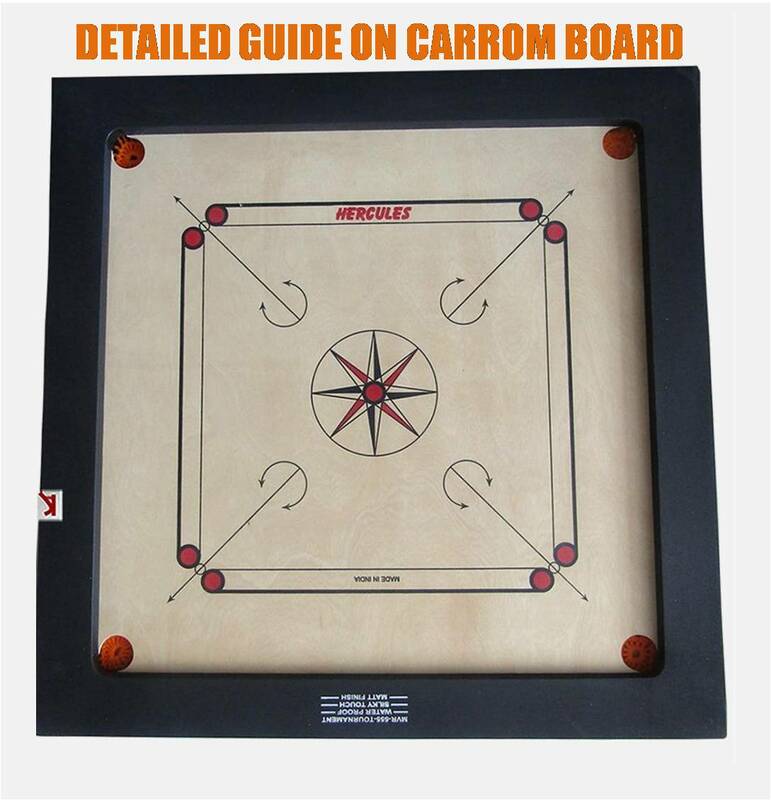 Its carrom board variants are made for both casual play and club games. Stag also sells carrom gears such as coins, stands, and powder. Its championship model is the most famous model among other products. 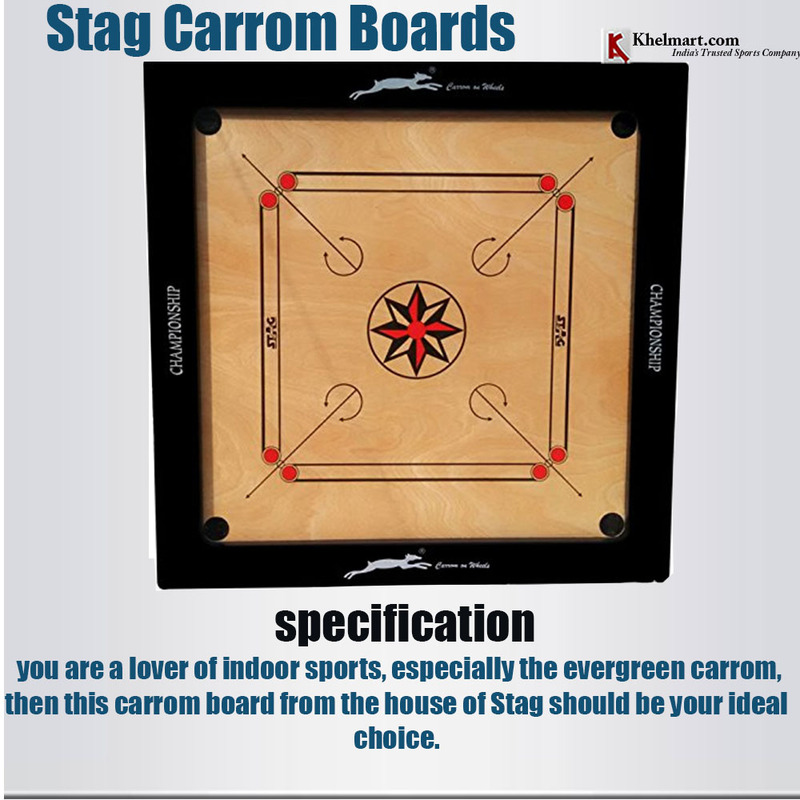 The price of Stag carrom board varies from Rs. 2,300 to Rs. 6,000. This band deals in carrom boards only. The brand was established in 1974, and they are delivering excellent quality carrom boards at the best prices. The boards are available in small, medium and large sizes. Korners Sky offers a smooth playing surface and great rebound. You can buy this carrom board to enjoy this game with your friends and family and have a good time. These boards are high in quality and best in the prices. Virloc is Mereut based brand which offers quality sports equipment. 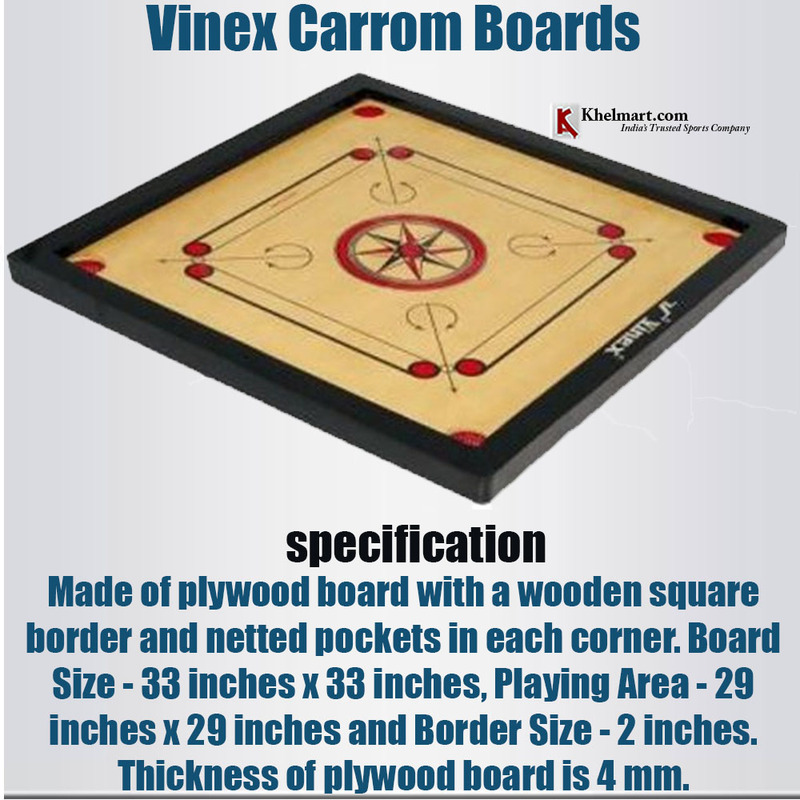 Virloc Carrom boards are developed with manual skilled and high quality material which offers smooth surface and better playing environments to carrom players. So, these were the best 10 carrom boards brands to buy in India. The game of carrom also helps the kids to master problem solving and cognitive skills. Always consider the best brand while buying a carrom board as it is not easy to buy it again and again. You should always try and buy the waterproof and scratch-free one so that you can play it both indoor and outdoor. Be wise and choose the best! 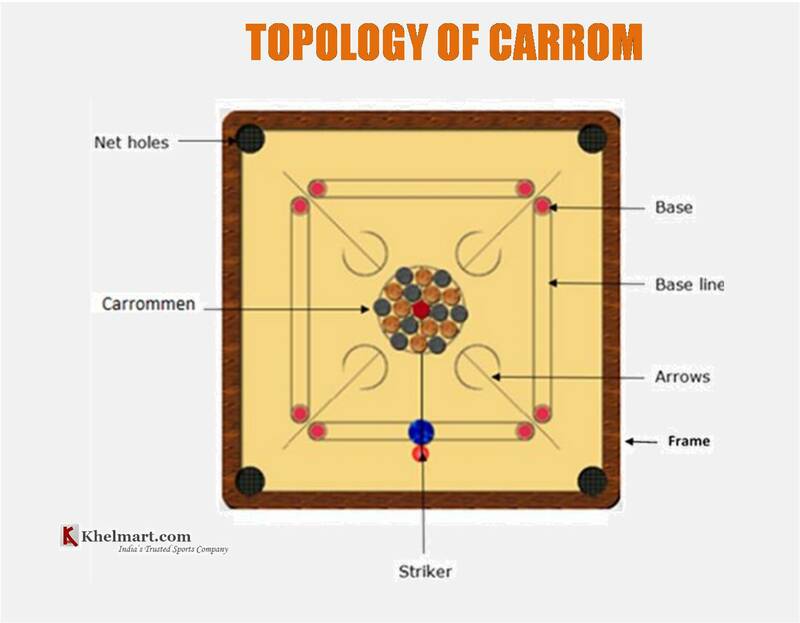 Carrom is a cue based table top game that was initially played at home just for amusement, but gradually became the part of national and international championships. Popularly played in clubs, cafe house, etc. it is a simple game needing understanding of angle, outstanding accuracy and intense focus. This table top game is said to have originated in South Asian countries in 18th century. Named differently in regional languages, it is popular in Sri lanka, India, Afghanistan, Nepal and in areas situated in proximity of these. The rules at national and international level as per ICF are similar in all nations. Players are supposed to use their fingertips to flick a plastic made circular shaped Striker. Striker is used to move and pocket any of the round and small wooden carrom men into holes situated on four corners of board. The game is all about pocketing as many carrom men and queen by following rules laid down by the federation. 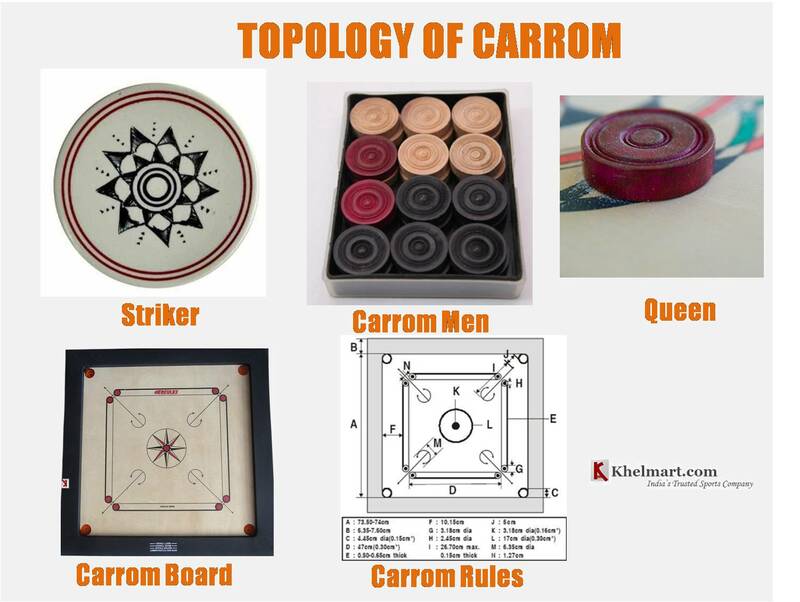 Carrom may be played in singles or doubles in both men’s and women’s category. The maximum team size is two. It is not played in mixed doubles team at any championship. However, the players with same nationality are grouped into team at major carrom events held all over the world. Carrom men – These are small circular pieces of wooden in three colours white, red and black. The strength of all the carom men are fixed, i.e. nine black, nine white, and one red (queen) precisely. Striker – It is larger when compared to the size of carrom men. It is a circular piece made of plastic having the purpose of hitting the carrom men to the pockets situated on four corners of the board. Powder - A soft and unique boric acid based powder is also a part of carrom, that is sprayed on the board to reduce friction or to confirm smooth movement to carrom men and striker. Light - With a motive to facilitate better visibility, a source of light is hung over the board. Apart from enhancing the visibility for players, light produces heat that ensures lesser amount of powder sticking to the round tools of carom. Stand - In order to have the carrom board at comfortable height, a stand is used to place the board. You may get to see many lines on board. Each and every line has significance in the game of carrom. You may see a well decorated circle at the centre. It is the spot where all the three types of coloured carrom men are placed together at the start of the game. The base lines on four sides may be said to be home to a striker as players are supposed to place the striker here on the base line of their side before striking. Watch out for arrow showing off way to players towards the holes on all corners of board. Look for base circle situated at the end of every base line. The board is made of wood but its surface is of plywood with minimum 6mm thickness. The playing surface of the ply is then surrounded by the wooden frame of 1.90 cm to 2.54 cm. The width of frame can range from 6.35mm to 7.60mm. You may also see in centre a red circle. Near the centre circle, an outer circle is drawn and is the place where all carrom men are placed. Carrom boards are available in various sizes and materials. The size and material of carrom is fixed at competitive levels. They are available in smaller size and in plastic for kids playing casually for fun. Queen - It is a red collared carrom men having maximum value and is to be placed at the center of the board at the time of commencing the game. Foul - Any wrong strike by the player is considered a foul. She/he has to miss their turn and stand a penalty of one carrom men. Break – The very first strike on the board is termed as a break. Push – It is an abrupt yank of the board called push. It is a sort of foul. Strike - The act of hitting of carrom men with a striker is said to be a strike. Due – The submission of carrom men on the board at the time of foul is said to be due. Penalty - A penalty is applied on players in the case of violation the laws of carrom. Covering - It refers to pocketing a carrom men as coat for the queen. Thumbing - Strike played with thumb is referred as thumbing. White slam - It refers to winning all white carrom men with or without queen. Black slam - It is succeeding to pocket all black carrom men with or without queen. ICF, the governing body is entrusted with the responsibility for laying the Laws of Carrom or international rules of Carrom. ICF possesses the authority of ranking players on the basis of their performance, plans the tournaments and conducts tournament across the world. It has numerous national affiliates such as United States, Carrom Association, Australian Carrom Federation and the All-India Carrom Federation and many more around the world. The order of play is determined by an umpire through the process of toss. The umpire and the representative of two competing teams are involved in the event of toss. It doesn’t comprise of traditional tossing with the coin. Umpire secretly holds the two coloured white and black carrom men in his one hand each and let the player guess it. The one who guesses it correctly wins the toss and is given the choice of first strike. The winner of the toss is not only given the advantage of opening break, but can also decide the sides from white to black and give up the opening break. The decision has to be taken solely by the toss wining player and it cannot be passed to the opponent. At times, situation may turn out to be blessing in disguise for looser as he gets the strike in the case when winner opts to change side. The player who goes for first shot plays with white carrom and the opponent gets to play with the black carrom men. In the case if the striker does not score any points, the strike automatically passes to other team and gets the opportunity to pocket both black and white carrom men. If a player succeeds in pocketing any of the carrom men, he is given benefit in the form of one more chance to strike again. This is the moment when a professional player turns the table around and tries to secure queen without giving the other team a chance to intervene into their strategy. This is not all, for player successful in pocketing the queen, it is mandatory to pot any of the carrom men on a strike successive to the strike in which queen was secured. In case player fails to secure carrom men after getting queen, he is supposed to return the queen to the game and give chance to opponent team to secure queen and other carrom men. •	It is against the law of carrom to retain queen despite of getting failed in potting the carrom men after securing the queen as the queen has to be covered by all chances. •	There has always been confusion amongst the aspiring players regarding the thumbing. International Carrom Federation considering the different individuality as well as physical preference permits the players to strike the striker or shoot with any of his/her finger. It is also termed as Thumb hit, Thumb shot or thumbing. •	Players are said to have committed a foul on crossing the diagonal lines on the board. They should not cross the diagonal lines by touching the diagonals while striking. Pocketing the striker is considered as foul. Likewise, players must also confirm that their hand do not infringe the diagonal- either physically or aerially. •	A player on committing a foul is ought to return one carrom men that was pocketed by him earlier. •	Pocketing a striker amounts to foul and the player is instructed to pay penalty. This penalty involves giving up of 10 points. •	As discussed earlier, a foul is said to have occurred when a player touches or disturbs the position of carrom men and player is imposed penalty of 1 carrom men. •	The striking player loses his/her turn on striking the carrom men out of the board. As a result, striker loses his turn. •	Player loses his turn if a striker is pushed to hit the carrom men. Player is imposed penalty of 1 coin and also is supposed to give up chance. •	Pocketing the striker also amounts to foul. •	Securing the queen first is a foul again. So, this was a comprehensive insight into carrom- a mind-boosting and entertaining board game. Play it with all your heart and mind! he era began in the late 90s when stardom came into the gentlemens game, and then it was all started. Most of us are grown up by watching legends like Rahul Dravid, who showed the quality of patience in his entire career with his SG bat . And after that one decade, the legacy has been evolving in the hands of Cheteshwar Pujara with the same SG bats. After discussing the quality of defense, now it comes to the ability of power. From Srilankas Sangakkara to star batsman M.S Dhoni, the flow of runs and hitting of massive sixes is continuing with SS bats. So, the aphorism says if you want to create an impact with your bat in the cricketing world, then you got to go with something out of the box. Brands like Sareen Sports (SS) and Sanspareils Greenlands (SG) have been creating the finest cricket ornaments for many decades. And its a basic formula of any game if you want to train yourself to compete with the best, then you have to choose best. Undoubtedly, the Indian players are best in the world and the most popular in the cricketing world. This is not just that they are the best players or Indian team performing great in the cricketing world, but the reason is they have a huge fan following in the whole world and people like to follow them. They are enormously doing the massive endorsement out of the field and also getting handsome cricket wages. Now the question is why one should go for the expensive cricket bats ()? As we know in the game of cricket, Players play with two types of bats, one is Kashmiri willow and another one is English willow. Kashmiri willows are initial level bats, specially made for the beginners. These kinds of bats allow you to understand the basic conception of batting and strengthen your weaknesses. And now in terms of English willows, they are mostly used by the cricketing professionals. To maximize the quality of batting and to strengthen your skills, through which one can be able to maintain the standard of performance in the game of uncertainty. Brands like SS and SG have been associated with Indian cricket since decades and producing the finest quality of bats according to the players needs. So, now we are going to check out some expensive cricket bats of 2019 and thoroughly explain each of them. 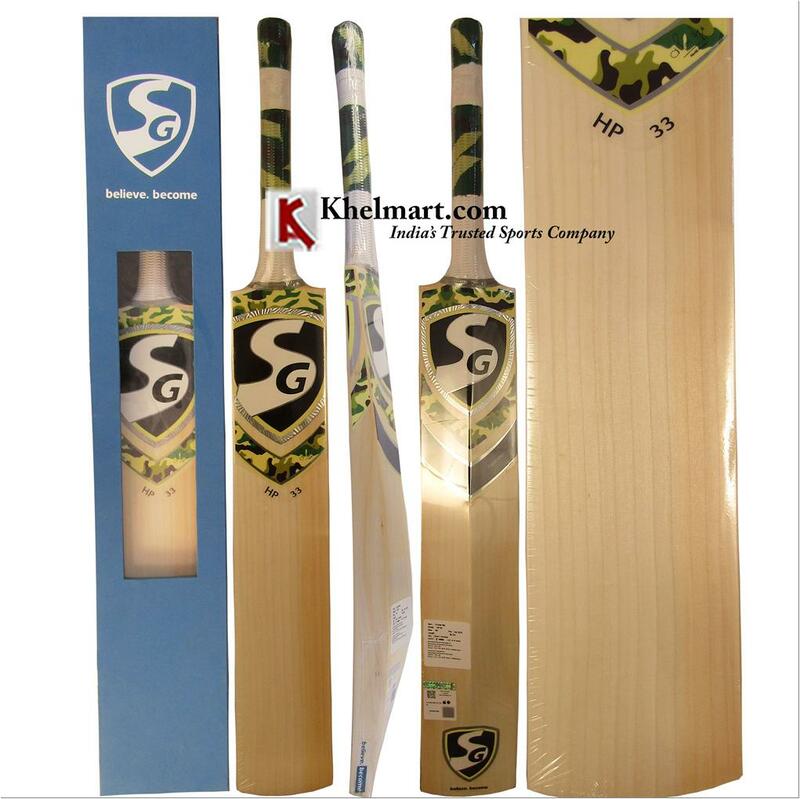 About bat: SG, HP 33 is one of the most advanced and finest quality cricket bats. This bat is endorsed by the star Indian batsmen Hardik Pandya. This bat is made from top quality of grade and is a custom-made bat from top grade English willow. This bat comes with several qualities which distinguish it from other bats. It is purely handcrafted by the luminaries of the SG brand. It shows some top class features like balance quality, light pick-up and weight distribution. Its specially designed for the young generation cricketers who like to play attacking cricket. It has a wide sweet spot and big edges, which allows the batsman to hit the ball powerfully. 1) Super handle: This bat has several pieces of imported Sarawak Cane, to maximize the strength quality. It is required to strengthen the bond between the handle & blade to maximize the transfer of durability & power. 2) Rounded face: The rounded face quality gives the pure direction of power into the hitting zone. 3) Lightweight: This is one of the essential aspects of this bat, it comes light in weight that helps the batsman to move his arm freely and meet the ball properly. This bat of SG brand is made from the finest quality of English willow cleft. The bat quality and performance is far ahead from the normal bats. This bat is made for the use of international players. It has some imperative aspects of fine wooden quality, lightweight, big edges and wide sweet spot. This bat is totally Custom-made to meet the requirements of senior players. It has a sweet spot position from mid to low. If we talk about the Edge profile of bat then it is around 39-41 mm. With the heavy 39-41 mm edge and flat face, the batsman can produce the destruction in his power shots. 1) Weight: With this lightweight bat, players can be able to hit the shots in his their comfort. 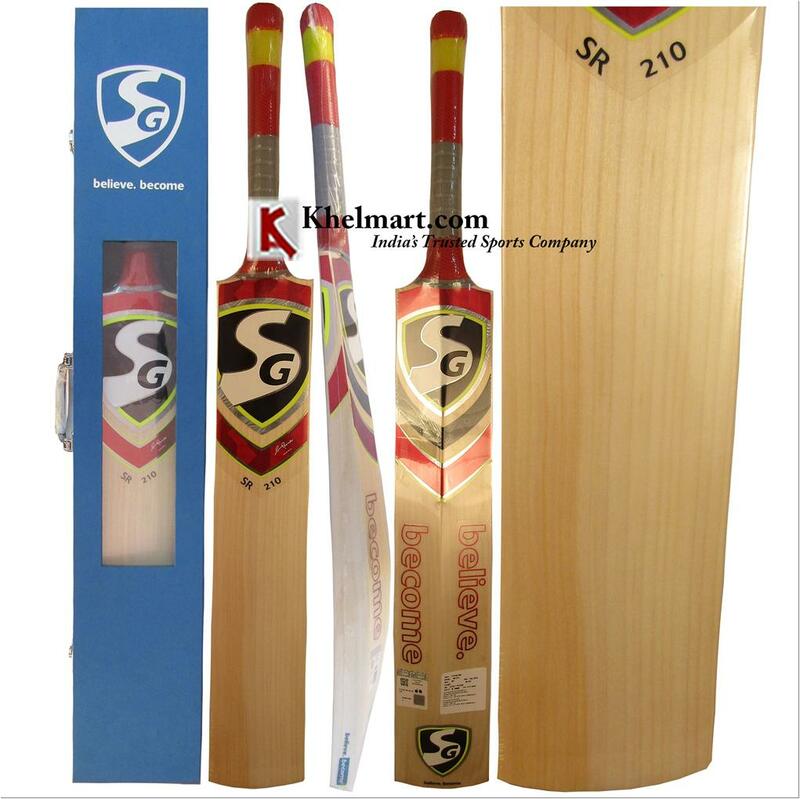 This SG bat is around 1180-1250 gms in terms of weight and the SG brand uses Hand selected technique, through which one can attain the highest standards and exquisite performance for players. And another aspect is, this weight range provides maximum side edge and also the maximum wood behind the sweet spot. This generates the power shot and will provide the ease to play in any condition. 2) Bat Handle: Handle is the essential part of the bat that allows the batman to create an impact while hitting the ball. This bat handle is made from Sarawak cane that gives you the superpower and better control over the shots. This one of the finest bat from SS brand which has been scoring runs from several years. This bat is made from the top grade English willow. 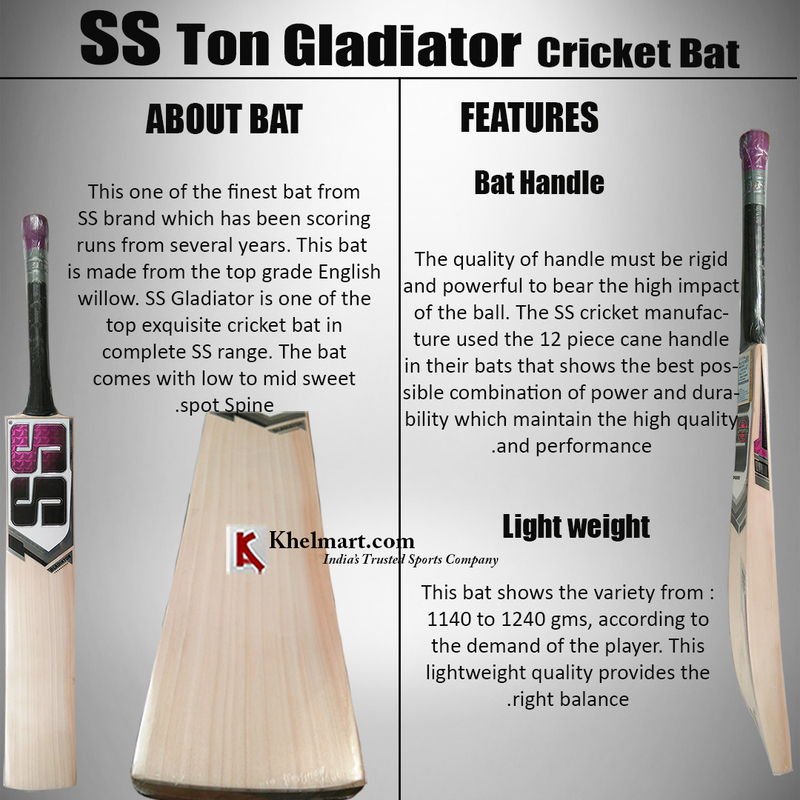 SS Gladiator is one of the top exquisite cricket bat in complete SS range. The bat comes with low to mid sweet spot Spine. The 12 piece cane handle, big edges, mid to low sweet spot and flat toe with the little round shape made this bat of high standards. This bat is considered as a Premium English Willow Cricket bat, and the player will have around 9 to 12 straight grains in it. 1) Bat handle: The quality of handle must be rigid and powerful to bear the high impact of the ball. The SS cricket manufacture used the 12 piece cane handle in their bats that shows the best possible combination of power and durability which maintain the high quality and performance. 2) Lightweight: This bat shows the variety from 1140 to 1240 gms, according to the demand of the player. This lightweight quality provides the right balance. Some of the other features include thick and concave edges and scale grips for better comfort and control over the handle. 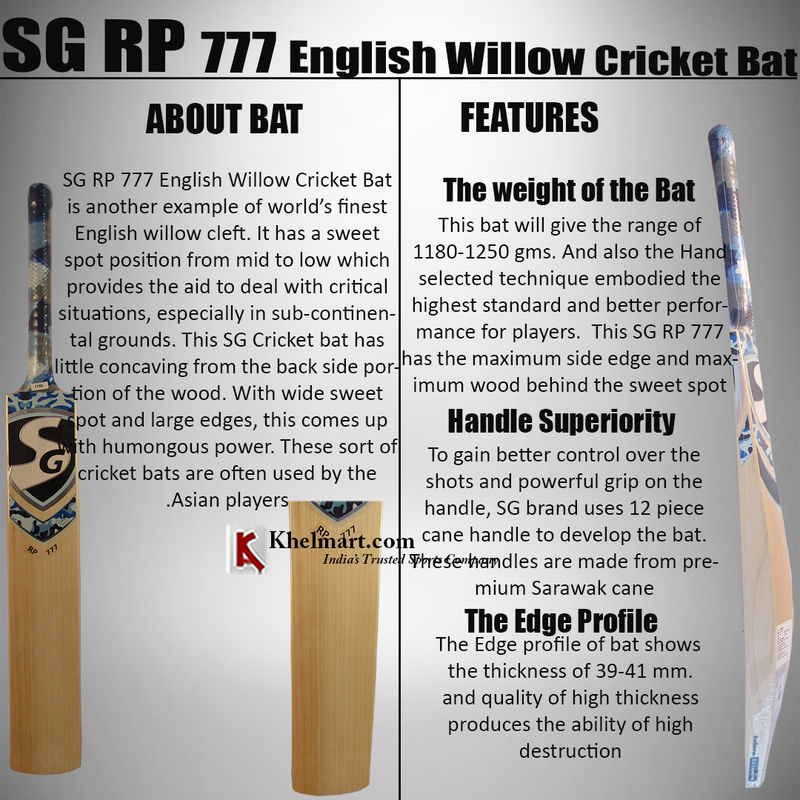 SG RP 777 English Willow Cricket Bat is another example of worlds finest English willow cleft. It has a sweet spot position from mid to low which provides the aid to deal with critical situations, especially in sub-continental grounds. This SG Cricket bat has little concaving from the back side portion of the wood. With wide sweet spot and large edges, this comes up with humongous power. These sort of cricket bats are often used by the Asian players. 1) The weight of the Bat: This bat will give the range of 1180-1250 gms. And also the Hand selected technique embodied the highest standard and better performance for players. This SG RP 777 has the maximum side edge and maximum wood behind the sweet spot. 2) Handle superiority: To gain better control over the shots and powerful grip on the handle, SG brand uses 12 piece cane handle to develop the bat. These handles are made from premium Sarawak cane. 3) The Edge profile of bat shows the thickness of 39-41 mm. and quality of high thickness produces the ability of high destruction. This SS ton reserve edition comes with extraordinary grain profile, around 9 to 12 straight grains. With the expensive price, it has also shown the exquisite features that are undoubtedly increasing the quality of this bat. With 12 piece cane short handle, one can easily attain the right balance. Mid to low sweet spot and round shape toe and highly concave edges features are maximizing its ability. 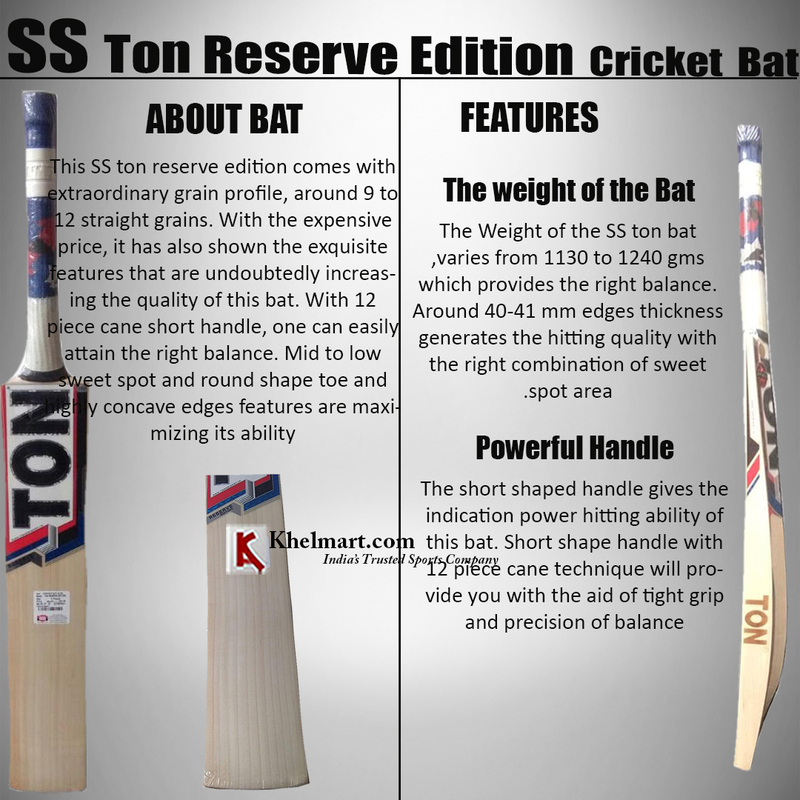 1) Weight: The Weight of the SS ton bat varies from 1130 to 1240 gms, which provides the right balance. Around 40-41 mm edges thickness generates the hitting quality with the right combination of sweet spot area. 2) Powerful handle: The short shaped handle gives the indication power hitting ability of this bat. Short shape handle with 12 piece cane technique will provide you with the aid of tight grip and precision of balance. So, these were the awesome yet expensive bats of 2019. Despite the area of high price, these are must buy bats. Generally, every player wants to start their journey with the best and to choose the best for your success, its an intricate thing. But if you are watching someone who has been giving a great performance with their cricketing choice, it will provide you with the ease to make your decision with precision. These bats with their unique features will provide you with help to improve your game. Badminton has always been a great racquet sport that provides numerous amount of benefits for the players. Whether you play this game in singles or doubles, it is a fun and interesting sport to choose if you are considering doing an activity which can boost both the physical and mental aspects of your health. However, the most important thing in this game is having a good badminton racket. Especially the beginners face a challenge as they do not know much about the game and its requirements. As a result, the beginners end up unsatisfied with the racket as it might not be appropriate for them. It might even lead to injuries. In some cases, they may even buy another racket and end up wasting more money than what was required. In such cases, players should always go for Yonex Badminton rackets which are very reliable, comfortable and extremely light in weight. 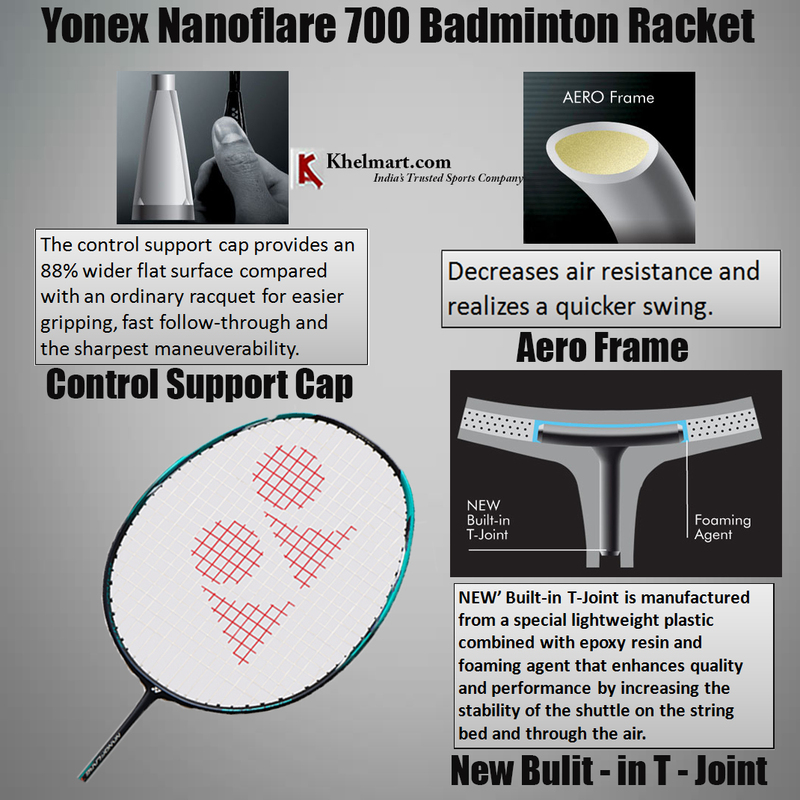 Yonex has introduced its new series of badminton rackets - Yonex Nanoflare series. 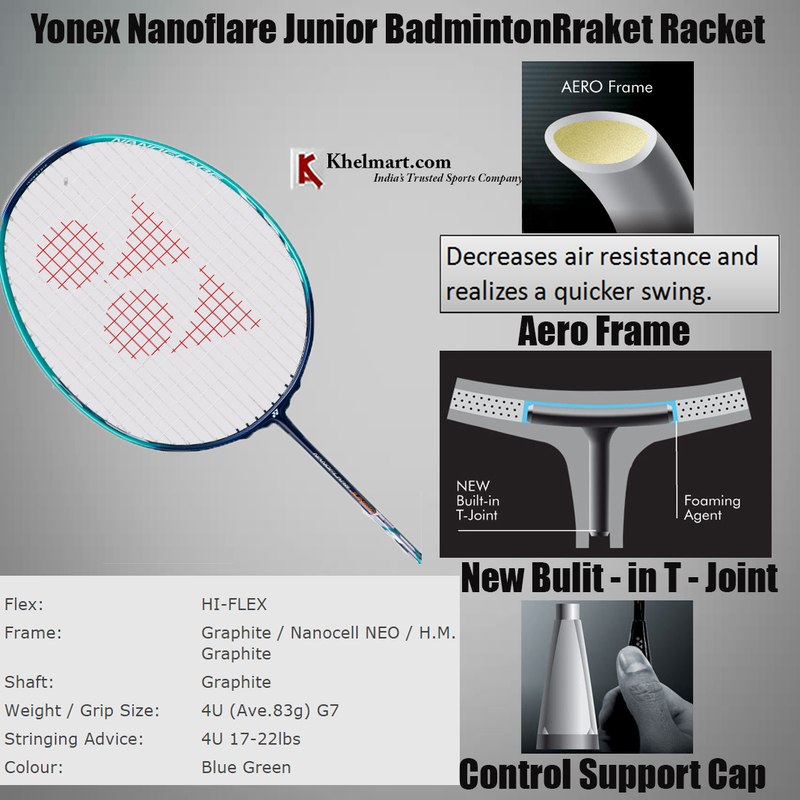 The new 2019 Yonex Nanoflare Series reinstates the popular Nanoray series of Yonex badminton rackets This new Nanoflare series comprises of enhanced materials and advanced engineering. Similar to the old Nanoray series , the head of the racket is very light and is made with primary focus on skilful players who believe in clears and drops to improve their game. This series features the new Sonic Flare System technology. This means that the rackets are made up of graphite material M40X* and the super high modulus graphite which provides unmatched power and stability for utmost shuttle acceleration. This Nanoflare series is very different as compared to the other rackets as it provides the players with the perfect control. The racquet functions at the molecular level which makes the racket ultra-lightweight. These racquets are thinner, stronger and comparatively more stable than the ordinary racquets which offer major power and great speed from swinging. 1)TORAYCA(r) M40X- It is being said that is the best next generation robust but highly flexible carbon fibre, which was developed by Toray Industries, Inc. This is very new in the market. This material makes the racket really durable and provides excellent speed and grip to the players. 2)Sonic Flare System- It provides the best shuttle acceleration. The advanced graphite material TORAYCAR M40X and the super HMG provides the players with the great power and excellent speed. This technique was made to ensure that the shuttle gets proper speed. This is also something very unique as not many rackets are designed keeping this in mind. 3)Super HMG- The next thing used in this technology is super HMG. This super-elastic material creates sharper power for all type of shots. This is also a vital part because power is most important when playing the shots. This technique enhances the game of the players. 4)Isometric- This is something different and unique. The shape of this racketis a square-shaped ISOMETRIC frame which is created to ensure that the vertical strings remain at the same length. Apart from this, the horizontal strings also produce an enlarged sweet spot in all the directions. 5)Super slim frame- The frame of this racket is very sleek and gives it a stylish look. This frame offers a tremendous head speed which also gives it a solid feel. The frame is very thin, if we compare it with other rackets. This is one of the reasons why players are being attracted to this Yonex badminton racket. 6)New Grommet Pattern- This racket has single-pass grommet hole design which offers more grommet holes. This provides the player with high-performance stringing design. It makes the racket more durable and long-lasting as stringing plays a major role in increasing the life of a badminton racket. 7)Solid feel core- In these rackets, there is built-in solid feel core which reduces different kinds of harmful vibrations at impact. This technology is used in Yonex badminton rackets, as they are made in Japan. All the rackets manufactured in Japan have solid feel core as it makes the play better. 8)AERO Frame- This technology used in the racket decreases the air resistance and makes the swing quicker. 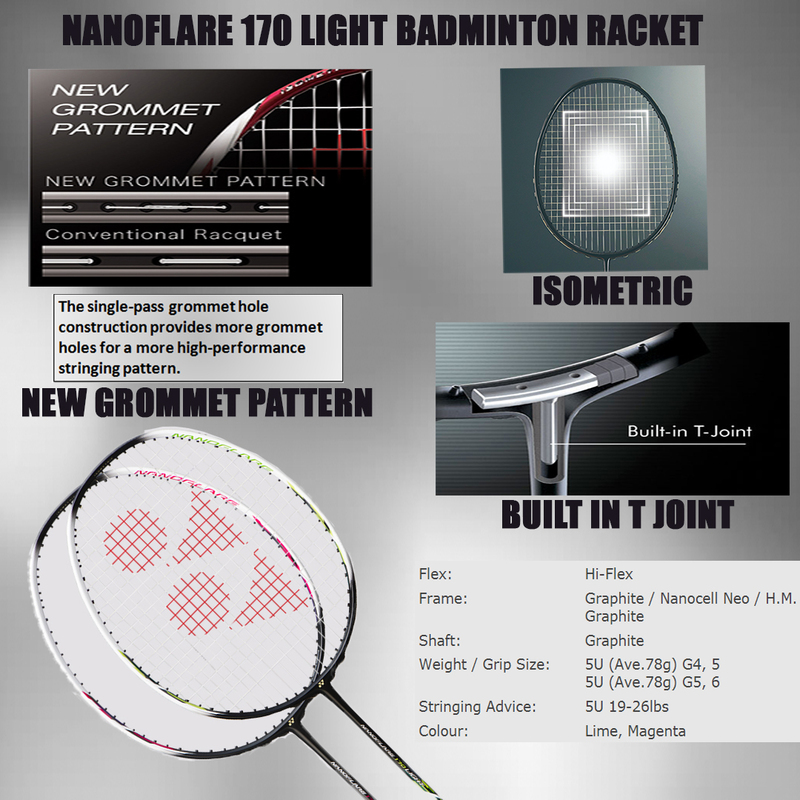 All the technologies used in this nanoflare rackets are unique and new for the players, so is the aero frame technology. 9)New Built-in T-Joint- This is something very interesting to know. The built-in T-joint of this racket is manufactured from a very different kind of lightweight plastic which is blended with resin and foaming agent. This enhances the quality and performance of the game by enhancing the balance of the shuttle on the string bed and. This inbuilt t joint in the racket makes the racket tougher and gives better flexibility for better shots. 10)Control Support Cap- The control support cap of these Yonex badminton rackets offers 88% wider flat surface as compared to the ordinary racquets. This gives better gripping, sharpest motility and fast follow-through. This technology is one of the best and latest. Opting for it can boost your confidence in the court. It has everything - sleek look, durability, grip and flexibility. Well, it is very difficult to specifically say what is unique about this series because almost all the features in this racket are very new and unique for the players. It provides the players with a very flexible shaft. It is very light in weight and players say that it feels as light as the shuttle. The grommet as mentioned above is quite different from other rackets as it has more grommet holes which makes the racket more durable and needs less maintenance. The looks are fabulous, as the racket is so sleek and it feels really nice to hold it in the hand. Not only this, sonic flare system and HMG combined together make the racket even tougher and prepare it for worse conditions. The TORAYCA(r) M40X is the best thing used in this technology, as it makes the racket really strong and bear heavy duty. Therefore, these rackets are a great value for money. One should always opt for this racket as it has all the features that any badminton player would wish for. 1)Nanoflare 700- This racket offers the players with maximum speed amongst all. These rackets are made in Japan, so there is solid feel core in it. It is made from the new TORAYCA(r) M40X, which makes the racket different from others and also stronger. The new grommet pattern is also used along with control support cap. The sonic flare system and super HMG together provide immense power to this racket. 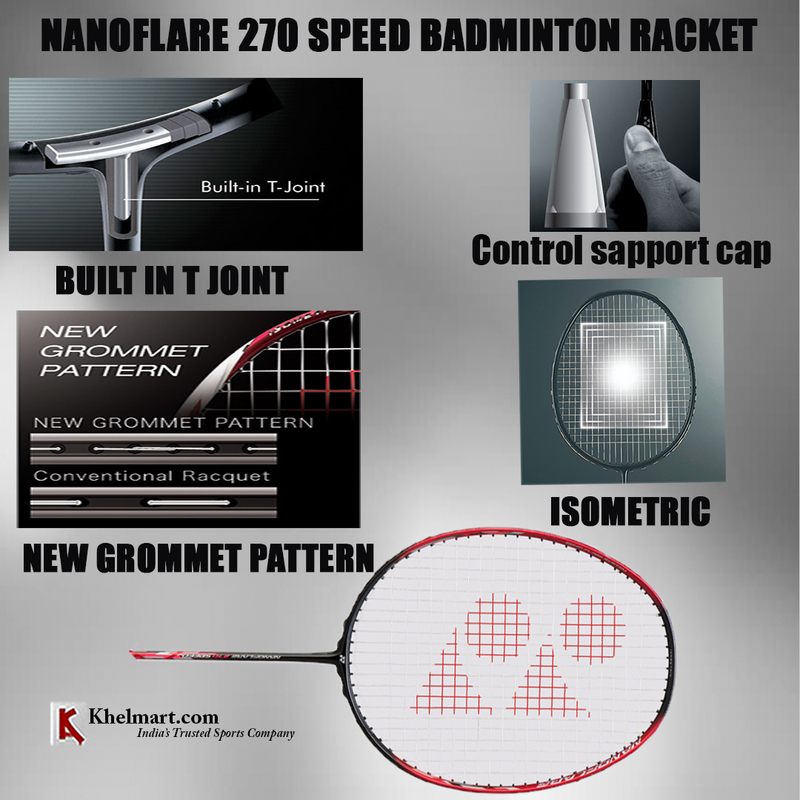 2) Nanoflare 370 speed- This racket has a different feature i.e. Nanocell Neo which is a flexible graphite material. This makes the grip really good. The colour of this racket is really nice i.e. Yellow, which makes the looks of the Yonex badminton racket more appealing. It has the same features as the above racket - aero frame, built in t-joint, control support cap and sonic flare system. One of the major differences is that it has speed of 370. 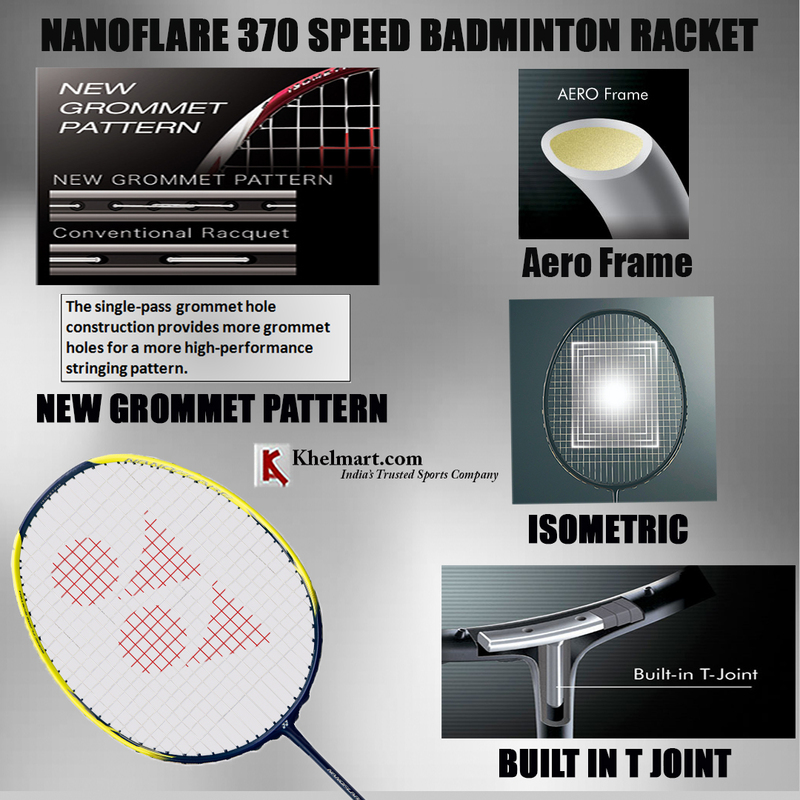 3) Nanoflare 270 speed- This racket has all the above features except that it offers the speed of 270. The other difference is the colour, which is red. This colour is very much in demand as this racquet with isometric, super sleek shape combined with red colour, looks fabulous. 4) Nanoflare 170 light- This racket also has the same features as above, one of the difference is that it comes in 2 colours which are lime and magenta. The best thing about these rackets is that every racket has different colours and all of them are very elegant. This racket as well is very light in weight and the player feels really comfortable using this racket. This racket can be used by all type of players, be it a beginner, intermediate level or professional level player. 5) Nanoflare Junior- This racket is for the juniors. Yonex always thinks about everyone while making rackets, be it, kids, beginners or an advanced level player. The colour of this racket is very beautiful and designed according to the kids with blue and green colour combination. It has the sonic flare system, the same isometric frame which makes it look really good. This racket for juniors also has the built-in T-joint for greater flexibility and also has the aero frame feature. This was all about the new Nanoflare technology by Yonex. Make sure that you take a wise decision and choose the Yonex badminton racket for yourself, which provides you with all the specifications that are required by a badminton player. Being a badminton player or a fan of this game, you would have had the experience of being in a state of awe regarding how the players manage to deliver great quality shots with unbelievable speed. Apart from the solid experiences gained over time and daily training, great perfection is also built on exceptional footwork which greatly depends on the kind of shoes a player wears. In Badminton, footwork is an essential element which drives the contact point, shot stability and timing. If a players shoes are not that great, he might fail to take himself to the contact point easily. Quality and placement of the shot might get jeopardized, which would result in underperforming attack or defence. Badminton players need to move a lot while playing. When they move around it pressurizes the forefeet that can be painful at times, especially when you are relaxing at night. So it becomes essential that the shoes which hold your body weight should be extremely comfortable and cushioned. Itshould allow your feet to breathe comfortably without tiring them. Not to forgetthat, not only do the players use their hands while playing this game but also the feet. Without your feet supporting you, it might become difficult for you to become a winner as the placement would get difficult and even timing might not match if the shoes are not good. So while purchasing the shoes, you need to make sure that you buy Yonex Badminton shoes as they are of excellent quality and Yonex excels in all type of products when it comes to Badminton gears. Yonex is a very well-known brand and quite popular among the players and especially youth as its products are very reliable and has an excellent value for money. You can always dominate the court when you are wearing these shoes which would give you immense confidence and explosive power. Yonex badminton shoes100 DR model is very sleek, have a lightweight design packed with the latest technology to make you look great and feel confident on the court. These shoes are all-round non-marking shoes. They are very gentle on the feet and have joints with excellent grip. Undoubtedly, the key feature of all the YONEX footwear is the power cushion which absorbs shock and then releases the impact energy for smooth transfer to the next movement. Black and blue colour of these shoes are very attractive. Players like them very much and they are popular in the market because of the colour blend of these shoes. These shoes because of the bright yellow and blue colour. Players prefer these shoes because they even shine at night, if you want to practice in the court at night. They give a very bright and vibrant look. These shoes absorb shock and reverse the impact of energy. They are very light in weight, are very comfortable and provides excellent grip. These shoes are 3-times more absorbent than Urethane. There is a lateral shell which is on the outside of the forefoot which averts sliding of the foot at the edge of your sole. Also, there is one ultralight graphite plate which is placed under the middle portion to increase the stability and lessening the weight within the shoes. These shoes are a must buy as they come in such beautiful colours with so many benefits and are also very durable. Owning Yonex shoes is a pride for so many players. There are many international players as well, who love Yonex badminton shoes because of the stability, endurance, and cushion they provide. This is also one of the reasons why people want them,since their idol players wear them. The other reason for buying these shoes is the colour - lime and blue, it looks just amazing as the neon light of it gives it a rich look. Most of the young players go for this colour. The round Sole of these shoes is created to provide players with all-around support for cushy and smooth footwork. The best thing about round sole is that it ensures smooth movements and transfer of maximum energy. The burden on your feet specifically while playing high-intensity games is undoubtedly massive. So, the importance of these Yonex shoes and their sole cant be ignored. While most of the features are same as other shoes, let us discuss the grey and black colour of it. As most of the players like flashy colours some of them like subtle colours like black and grey. Usually, mid-age players prefer these shoes. The black colour of these shoes looks great, and that is the reason why players like them. Also, the power cushion of these shoes is impressive as they add to the speed, power, and agility that you will observe on the badminton court. 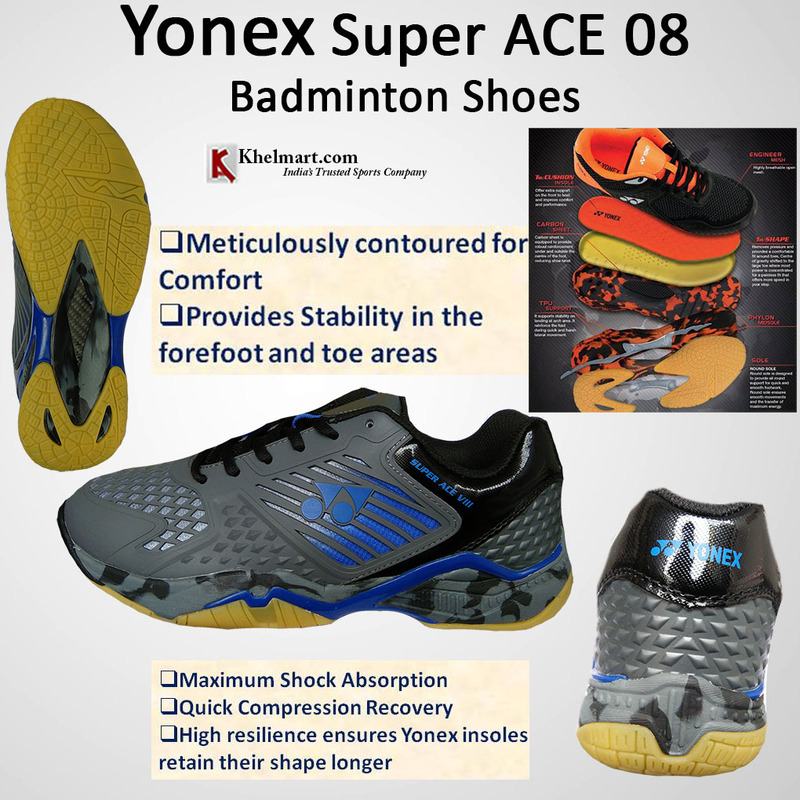 These shoes provide the maximum shock absorption among all the Yonex shoes. These shoes would give you immense comfort because of their power cushion. Not only this, they have a feather-like weight, so after a tiring match when you go to bed your feet would not hurt at all, and this is what every player looks at before buying badminton shoes. The shape of these shoes is unique i.e.ergo shape, this shape is specifically designed for badminton shoes. This shape has a contour which allows these shoes to be extra comfortable and provide more stability to your toes and forefoot . This feature is something very different and enduring making it a must try option. The black and red combination of these shoes is excellent as this is one of the best fusion ever. There are so many players who opt for these shoes because of the colour and shape of it. These Yonex shoes offer better stability on landing for quick and sharp movements. These are the shoes which have great flexibility and grip. These shoes can bear the wear and tear of weather and are very robust and durable. The best part about them is that they are anti-slippery ,which is an essential factor to consider when buying badminton shoes. Badminton shoes without anti-slip sole might acutely burden the wearers muscle and in worst cases, it can also cause foot injuries. A unique colour amalgam of blue and red which is rarely seen in shoes , provides the shoes with an unique look. Yonex makes its products after reviews of the players who use the product, so this colour combination was made as per the players demand. These shoes are in limited stock because of the colours, so you should grab one pair if you like them before they run out. The weight of these shoes is light because of the technology uses to make them - Hexa grip. This makes the shoes 20% lighter and offers 3% extra grip than the regular shoes. As Hexa grip is used in these shoes, your foot remains stable and makes the movement of them very smooth. Bendability of the sole of these shoes lets the forefoot to respond timely to the multidirectional steps. The movement of every step gets simple as smoothness and endurance for foot actions are enhanced in both ways. Hence, in these shoes, multidirectional grooves are added on to the sole to increase agility and provide you with smoother footwork. There are many noteworthy features about these shoes. First of all , the beautiful and elegant colour of black and orange, gives it a lively look. These shoes along with the ergo shape, Hexagrip, power cushions and the round sole is a complete package of what a player would look for in any badminton shoes. There are no second thoughts required about these shoes as they provide complete value for money with such elegant colour options which no other brand can offer. These shoes are very lightweight, durable, have quick compression recovery and also give an excellent grip to your foot. 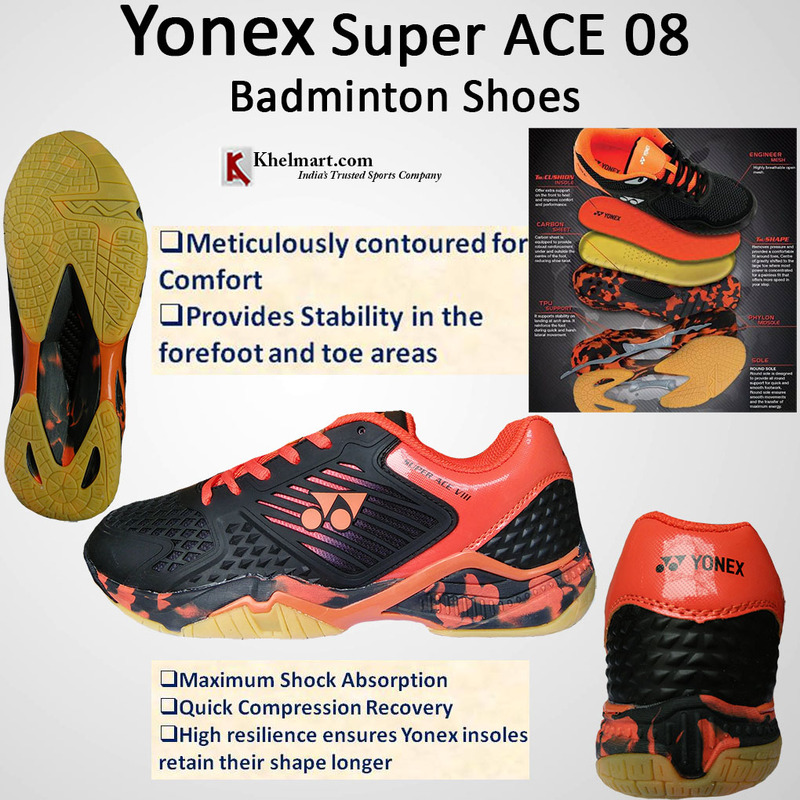 So, do not overthink, just grab a pair of Yonex Super Ace 08 black and orange badminton shoes now. 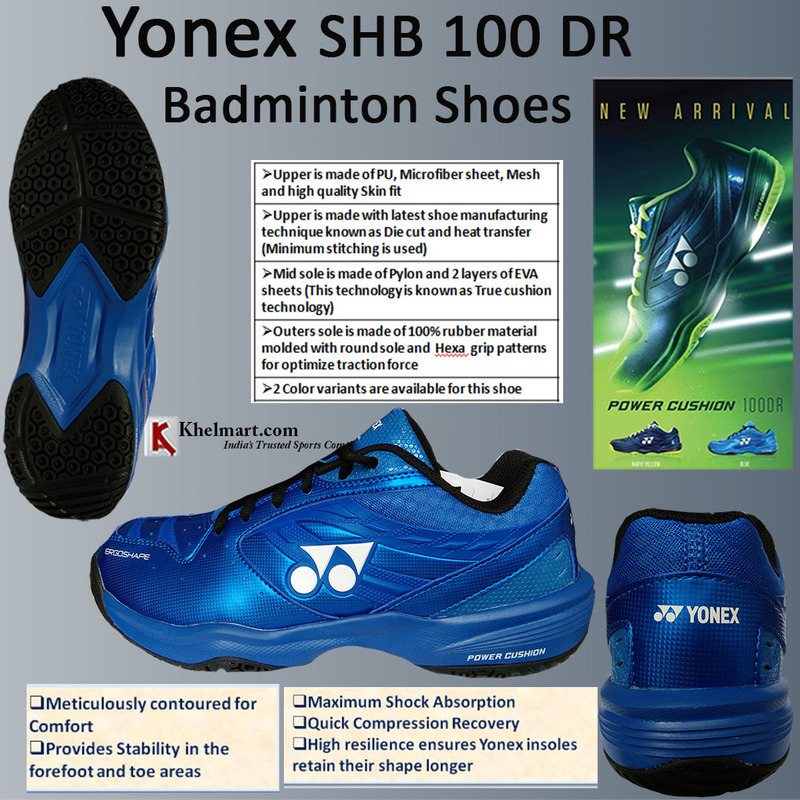 These are the best of Yonex badminton shoes which were recently launched with the latest technology used in designing them. They are readily available in the market and online at reasonable prices so that every player can buy them without any trouble. But make sure before buying any shoes, you check your requirements and see if they suit you and has all the features what you aspire for. Checking all the parameters before buying shoes is better than regretting after purchasing. Be smart and choose the best. Review of Yonex POWER CUSHION INFINITY Badminton shoes play a major role while playing the game. Yonex completely understands this and make the shoes accordingly. Yonex is one of the most reliable brands when it comes to making badminton gears, be it rackets, badminton bags or shoes. Yonex takes the game seriously as you do; this is the best thing about them. Not only this, it is a technology-driven organisation; they always try to explore new design, material and strive to make the best out of it. Whenever they design any badminton shoes it is mostly based on the reviews given by the players, so that they can work upon the limitations and requirements according to them. This is also one of the reasons why the products are so good and impeccable as all the requirements of players are completed in these shoes. 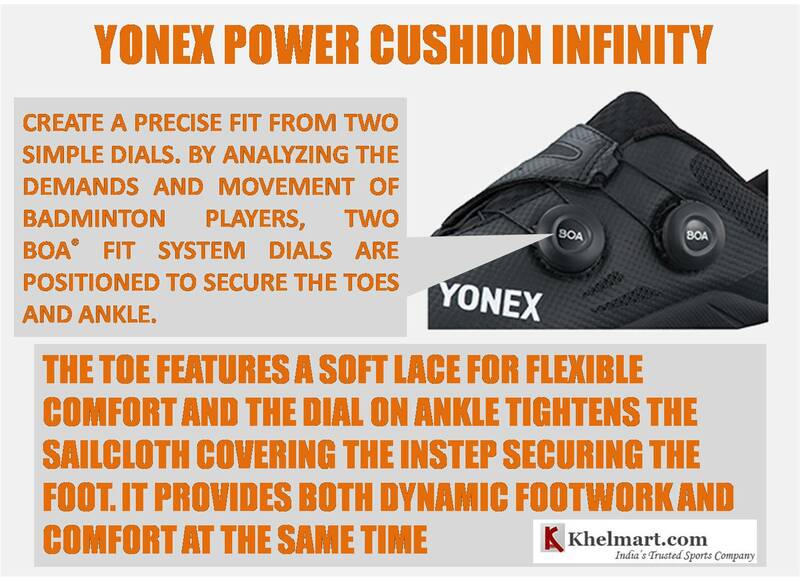 One such new technology is Yonex power cushion infinity which is introduced by Yonex so that the players can get the Best Fit and Comfort in Badminton Shoes. This is the first time ever that some company has introduced this technology. Yonex badminton shoes are well known for their durability, comfort, fit, grip and the best technology used to make shoes. The same goes with this new technology which would provide you with the immense comfort that your foot would not hurt at all. They are very light in weight which adds to the comfort. Yonex has proudly introduced the new Yonex Power Cushion Infinity badminton shoes. The pace of this game is getting faster, in the same way, more and more people have started loving this game. They look for a shoe which can also adapt to the fast and new style on the field like the new technology of Yonex. 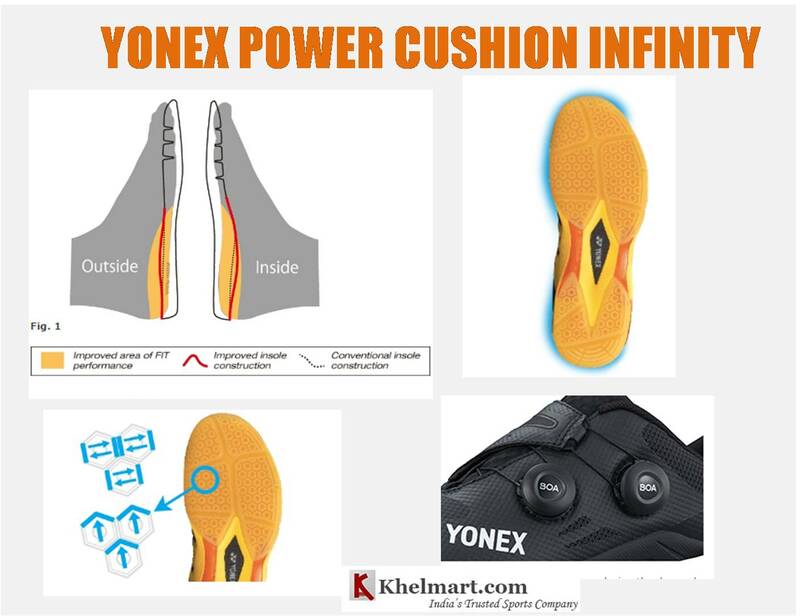 Let us know more about the Yonex Power Cushion Infinity technology used in badminton shoes from the basics to the technicality that is used it. The Yonex Power Cushion Infinity comprises a seamless upper with a double Boa system. There are two adjustment buttons in it which ensure quick, better adjustment of toes and ankles so that the players can get an unmatched fit. Furthermore, there is a 3D Carbon board which is added to the midsole of these shoes to give a stable landing to the player. 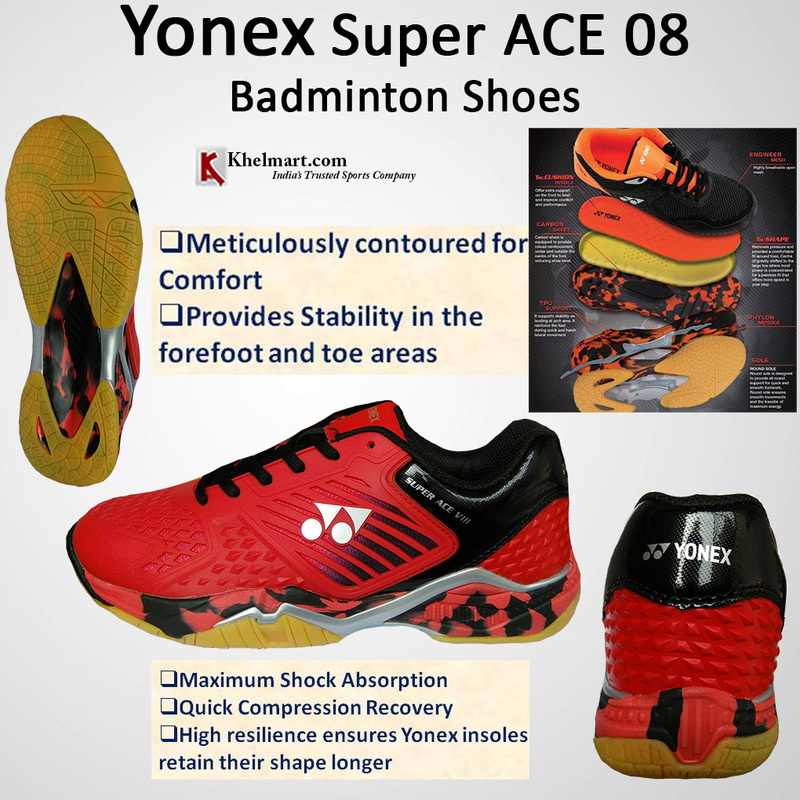 The midsole is outfitted with power pad + technology of Yonex. Whenever the player runs, jumps and sprints, it absorbs the energy created by the impact of the action and rebounds it. This technology is best suited for the aggressive pace of the players while also taking into consideration the fit, weight, stability and shock absorption. This is the most innovative thing about this technology, well calibrated double BOA Fit system which ensures a different and ingenious fit. There are two command dials which are - fixed one on the toe and the other on ankle position, by reviewing the requirements and movements of players. The toe position with the help of this technology gets smooth, flexible and enduring movements. Additionally, the canvas on its ankle can also be attached on the instep. These shoes not only meet a different kind of footwork when playing badminton but also they can be worn easily and effortlessly. Lets see the other aspect of these shoes which is just seen in Yonex shoes and introduced lately. Its Shock-absorbing Power pad + mechanics converts the impact forces of movements quickly into energy. Rebound and shock absorption have been greatly improved if we compare it to the basic power pad stuff. There were many tests conducted regarding these shoes and technology. It has been proven that, if we throw a raw egg from a height of 12 meters into this Powerpad + power cushion it would not break. This itself shows how comfortable and friction free your foot would be while playing badminton. This plays a major role, because of this feature the shoe becomes more enduring, flexible and gives a really good grip and fitting. 3D Carbon board: To give more stability to the players, the midsole which is placed on the outside of the sole has been made with the latest designed 3D Carbon Plate. After understanding the players requirements it is placed in the most needed area. It improves the rigidity where needed. This technology is amazing and very unique from others. These shoes have become very famous among the players as they are also being used by many international level players. As they are very light in weight many players prefer buying these shoes. Your foot would not hurt at all even after a long tiring day of play, as they provide you with such comfort that you would not feel heavy. The technology used is such that if there is any sweat coming because of the weather, it soaks in quickly without making the shoes heavier. They are made in such a way that they can bear all sort of wear and tear. Needless to say, Yonex badminton shoes are always very long lasting. For excellent grip and improved stability with every movement, this technology has been equipped with excellent power+ cushions and BOA fit system. One of the vital feature to consider when purchasing a pair of badminton shoes is it is cushioning. This is the major reason for the comfort level of shoes. So, keeping this point in mind the Japanese firm launched its renowned Power Cushion for utmost shock absorption and excellent traction while playing. The badminton shoes look really amazing and the colours are also very elegant. It comes in 2 colours i.e.red and black. The design of the shoes is really unique because of the BOA technology used. It also makes wearing the shoes very easy and trouble-free as you do not have to tie the laces. 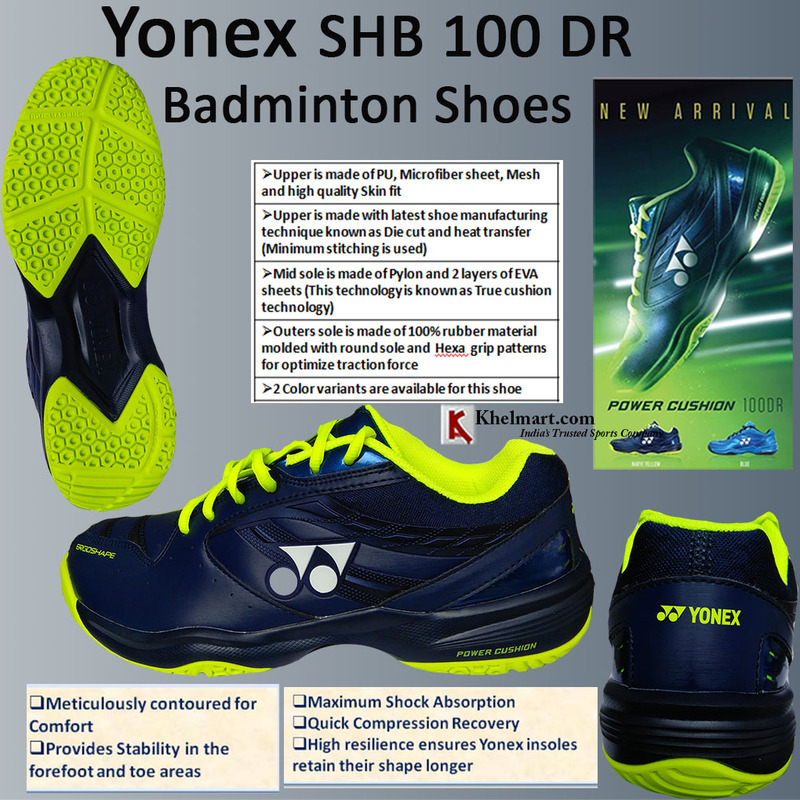 This is also one of the elements, why players attracted to these Yonex Badminton shoes. In recent times "the fitting characteristics" of the badminton shoes are made in such a way, as the game of the badminton paces up and rebounds back in counter to the shuttle quickly. 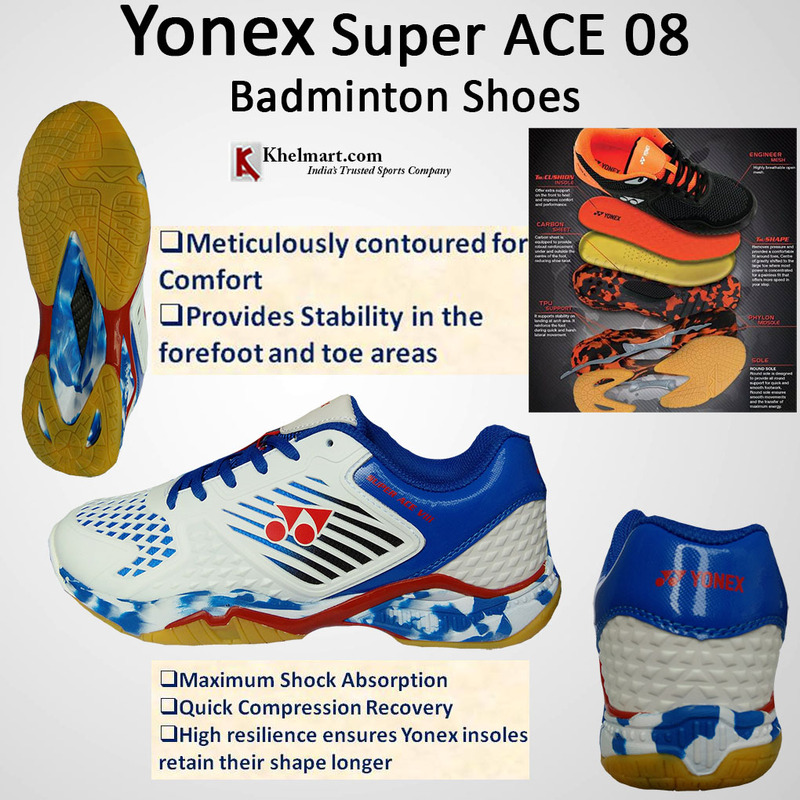 Yonex has worked on this concept and integrated them in making the shoes. There is a wire which tightens just to turn a dial to the shoes and stations the Boa system which is adjustable. You can adjust the ankle and toe both according to your comfort level. You can loosen it or tighten it as well. The tiptoe portion of the shoe has the ankle outer area with great design so that you can close well. 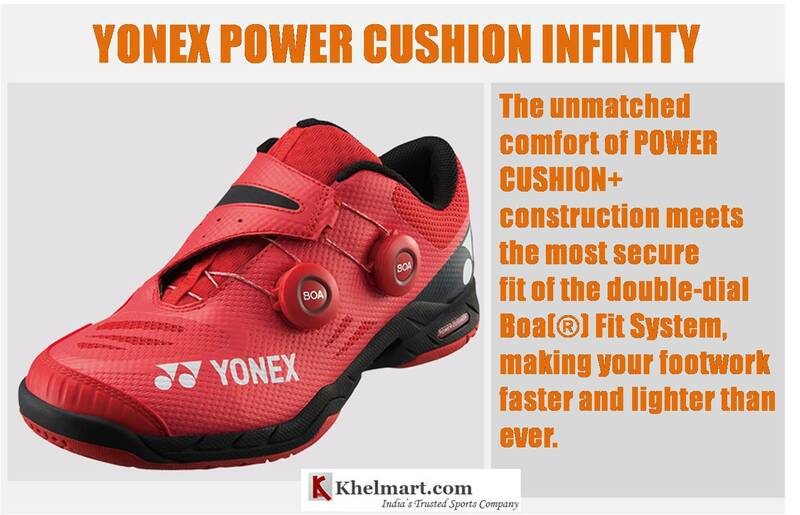 Once you wear it, you will realize how cushy they are and then you would be able to make the difference between the normal shoes and Yonex power cushion infinity technique. The 3d carbon mechanism used in the shoes increases the stability of the shoes. The torsional stiffness to the outside of the shoes is around 20% more in these shoes which is the reason why they are more stable. Seeing all the aspects of these shoes there is only one thought which comes to the mind i.e. that these are a must buy for badminton players. Since the advancement used while designing and construction these shoes is very innovative and gives much more relaxation to the shoes while playing. This technology was made keeping in mind the important aspect that , the shoes does not become any hindrance while playing. Instead it should become a strength so that the foot movement becomes smooth and easier. 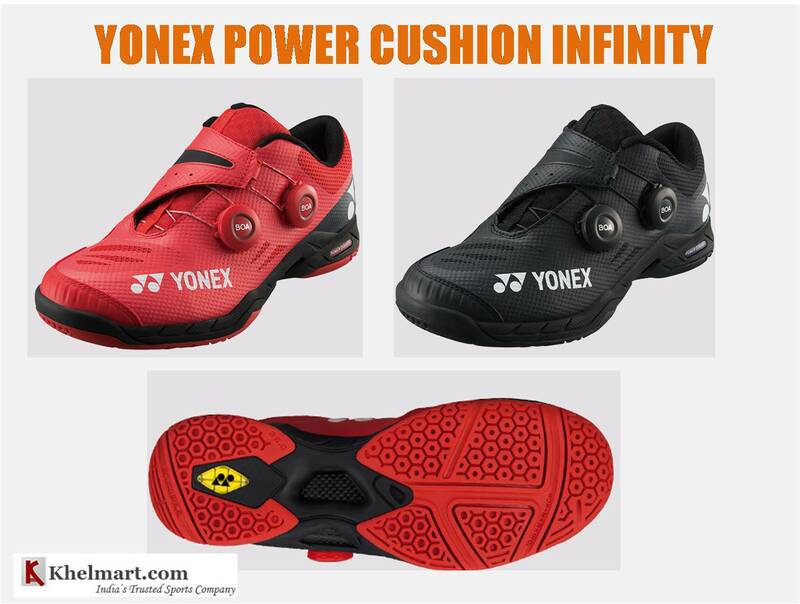 So, whenever you plan to buy badminton shoes opt for Yonex shoes, especially Yonex Power Cushion Infinity so that you feel more confident, comfortable and easy. Do not think twice to go for it as it is a complete value for money. If you are a badminton player and know much about the game, then you must be well aware that stringing your badminton racket is an inexorable process. The strings in your racket are bound to be repaired at one or the other time, especially if you have been using the racket for a long time. Time and again, you are required to restring your Badminton Racket, even if you purchased it as a pre-strung racket. Stringing of any racket is a slightly tricky process which needs you to consider a few aspects. However, maintaining a Yonex Racket is not that complex as they are very durable. If you are a beginner, then you would need to understand the correct string tension, which are the best quality strings that you need to use and the perfect stringing pattern which you should adopt. Being a starter you might not know the importance of stringing. Poor string tension in your badminton racket would lead to unsatisfactory performance and affect your play. Your shuttle might not spring as high as it should when you serve and would not travel too far when hitting it above the net. Restringing the Yonex Badminton racket aptly would not be a problem for you. You would be able to do it yourself as well if you own a restringing machine. Also, you can take it to a professional for getting it repaired. 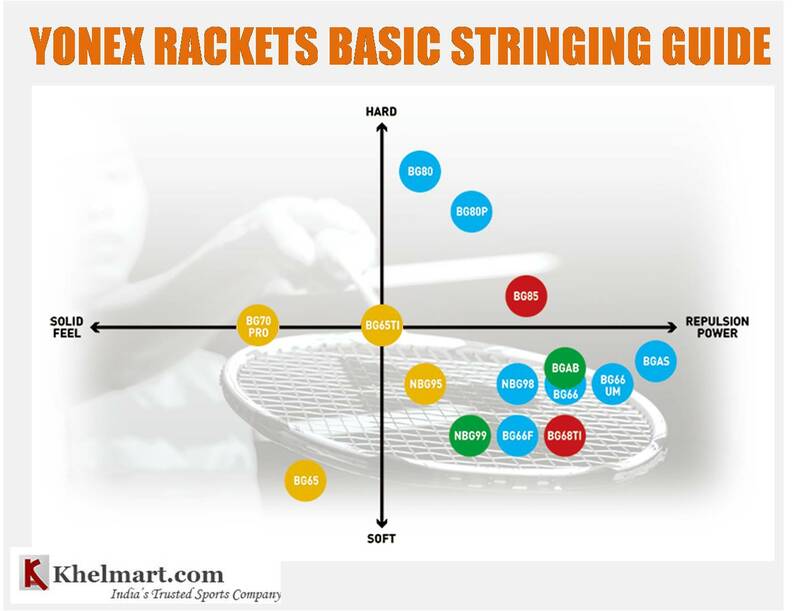 It costs a considerable amount for buying a restringing machine, but it would be beneficial for you to buy it if you are a regular badminton player. The things that you would need are strings, badminton racket, a stringing machine, clippers, awl- so that you can unblock the blocked string holes which are on your racket, pliers, and also a ruler. After gathering all the items, you can start with the stringing process. 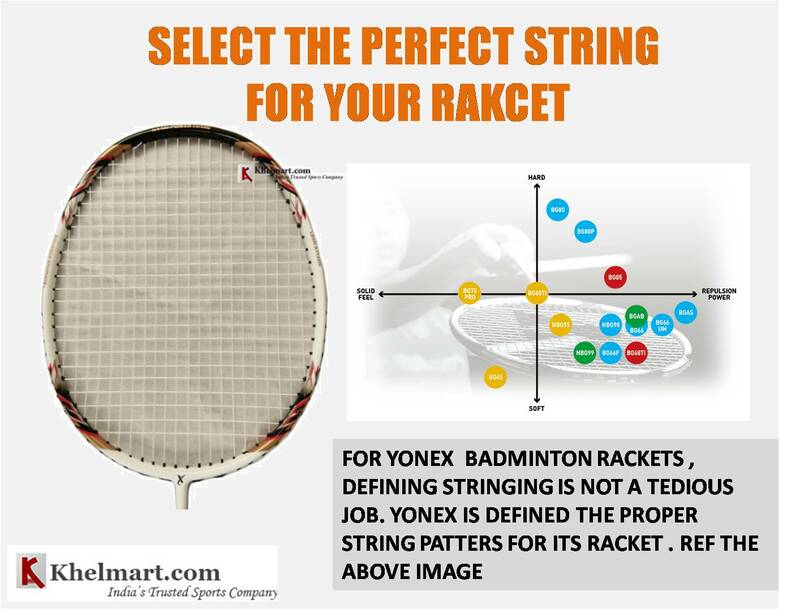 If you are a beginner, you would need to understand and master the best stringing idea and pattern that you should use for your Yonex racket. 1) First, you would need to measure the size of your the string that you would need for your racket. But make sure when you buy a replacement string it should be a synthetic one, not a gut string because synthetic strings are more durable. Using thinner strings would help you to play even better. But the only drawback with them is that they lose their tension faster as compared to the thicker strings. 2) After that, you need to select the amount of tension that you would need in the strings of your badminton racket. You would be able to aim the shuttle better if you have tight strings; as loose strings would prevent you from hitting the shuttle farther. Please note down the pattern of the string on your racket before taking off the strings. Restringing the racquet without remembering the pattern might damage the racquet. 3) Once you have the strings, then you need to straighten the strings to take of any unwanted kinks. This would help in avoiding any mess, once you have initiated with the stringing process. After that prepare your racket for stringing process by removing old strings on your racket and unclogging the string holes. 4)Once all this is done, you need to mount the racket and search for the starting point for stringing. Then hold the neck and head of the racket into the stringing machine as it should stay firm when completing the complete process. 5) First, you should put the main string in. Once you are well aware and checked the stringing point, put the main string in it and then pull one end of the string through the strings hole directly which is opposite to the starting mark. After that, you should tie the end of the string to the initiating point and run the other ends through the hole which is parallel to the point from where you started. The stringing machine would then pull up the strings to the tension which you had pre-set. 6) You can set the horizontal strings as well by using the same method. When you string the crosses, you need to weave these strings over & under the main strings so that the cross string can reach the opposite side of the hole on the racket. You need to remove the extra strings and tie it with a double knot. Once you are done stringing all the strings, then you should tie the knots of the string. But before you make the knots, it is essential to make sure that your racket is clamped well to avert the tension on the strings which would not let it loose. Once all the cross strings are completed, you should tie the knots and unclamp your racket. 7)Once this process is completed, you should take your Badminton Racket for a test to the court so that if you face any issues, you can correct them immediately, instead of checking on the day of your tournament. 1) Save the strings- There are numerous ways how your strings are connected to your badminton racket. In a few cases, a racket has two big strings: one is for the vertical, and the other one is for horizontal strings. Also in some cases, your racket might have plenty of single strings: one would be for each main and other for each horizontal. In case each string is broken, you can quickly clear away the unwanted string, and the other strings would be preserved. And if there are only two long strings, then you can use a knot to connect the last string to the grommet. You need to ensure that you manage the perfect tension and you need to use a specific clamp when you are putting the knot. After that, you can remove the rest of the strings which are broken. 2) Replace only the defective one- When you attach the fresh string, you need to bring it from one side to the other of the spout that has a missing string. You need to ensure that you are inlaying the cord next to the weaving. Say for example, if you restore a horizontal string. Every time the horizontal string at the bottom falls underlying the major axis, the string of your badminton should go beyond the main axis and the other way round. 3) Racket inspection is vital- Well, this is something to remind, but you should make sure that you inspect your racket on a regular basis. It is always crucial to do so before starting the restringing process. Inspect if there are any cracks or drooped areas in or around the frame. In case there are any such defects in your badminton racket, then you would have to be very careful as it could break your racket if you put it under pressure to restring it. If the racket breaks while doing stretching, this might lead to damage. Any defects in the frame imply its time for you to buy a New Badminton Racket. You should also check for injuries or missing loops during the stringing process. Damaged loops give added tension to your bat, which might cause it to break even more quickly. It is simple and favourable to change broken or missing grommets while doing string replacement. 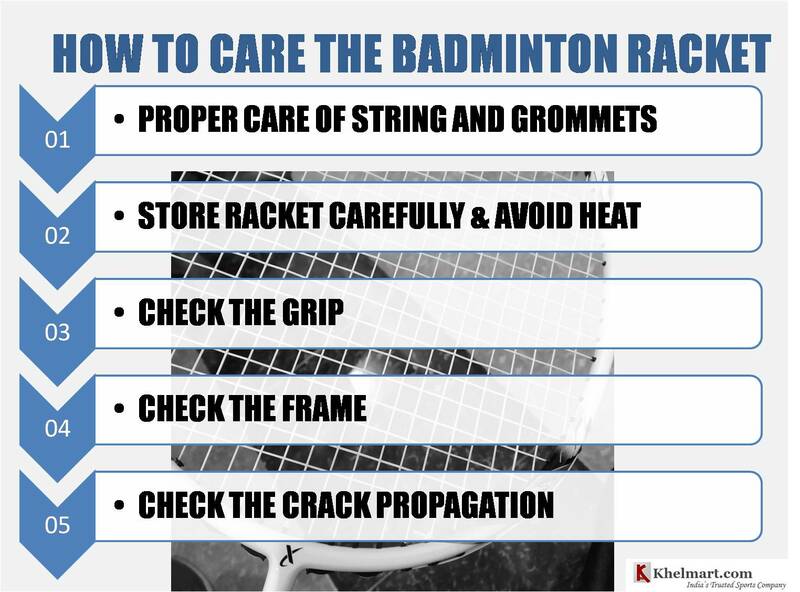 Do not forget that while a professional restring your racket, these errors are checked. So, it is crucial that you do the same. You would not want them to penalize or ask for some money for repairing or doing a replacement which you dont even need. 4)Adjust voltage according to your needs- If you do the re-stringing procedure of your Yonex racket yourself or by taking it to a professional, you would need to find out what tension you need. The reason is that the tension of the string always affects how much control and power you get while playing the game. It would also induce how long your string lasts. If you are a starter, begin with somewhere between 17 pounds to 20 pounds of tension. If you are a middle-level player, you can raise the tension to 22- 24 pounds. You may increase it slowly as your skills enhance. Usually, professional level Badminton players use the tension of around 30 pounds or more. However, you need to be cautious never to overestimate the range of tension you require. A lot of tension would come from your wrist each time you hit the badminton. This might cause an injury. 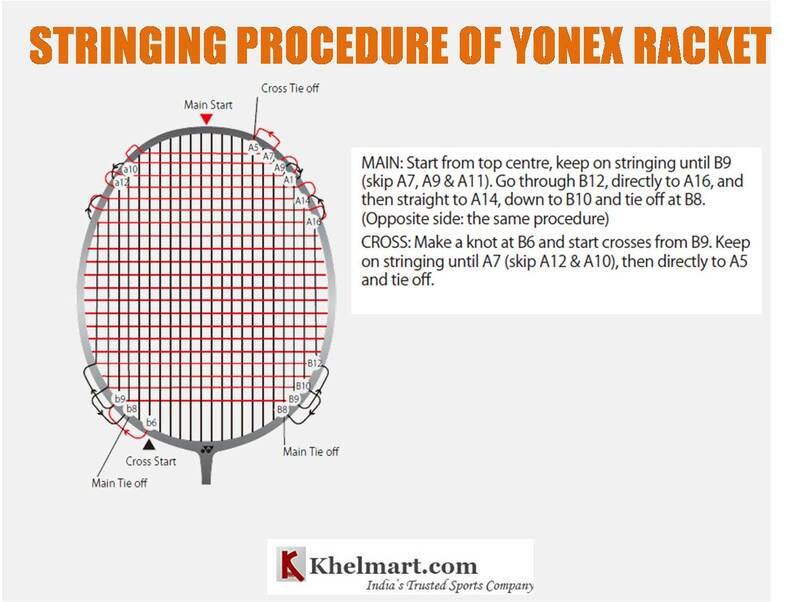 These were few tips and process of stringing your Yonex Badminton Racket. This would help you improve your play and maintaining your racket too. A badminton racket is without a doubt the biggest weapon on the badminton court for a player. As without it, the game cannot be fun. The racket must be light in weight, the strings must be of good quality, grommets should be fixed properly and there are many more things to check while buying one, so that while playing you just focus on your play instead of the gears and accessories. It is always good that you take good care of your racket always. So that when there is a tournament you do not have to waste time on preparing your racket instead you can spend that time on practice. 1) Strings- These are the primary thing one should always take care of as the rackets can only do their job well if the strings are in good condition. In case the string tension is not in line as per your standards or if the strings are broken you would not be able to give 100% performance. Hence, it is vital to always keep a check on the condition of your racket strings. 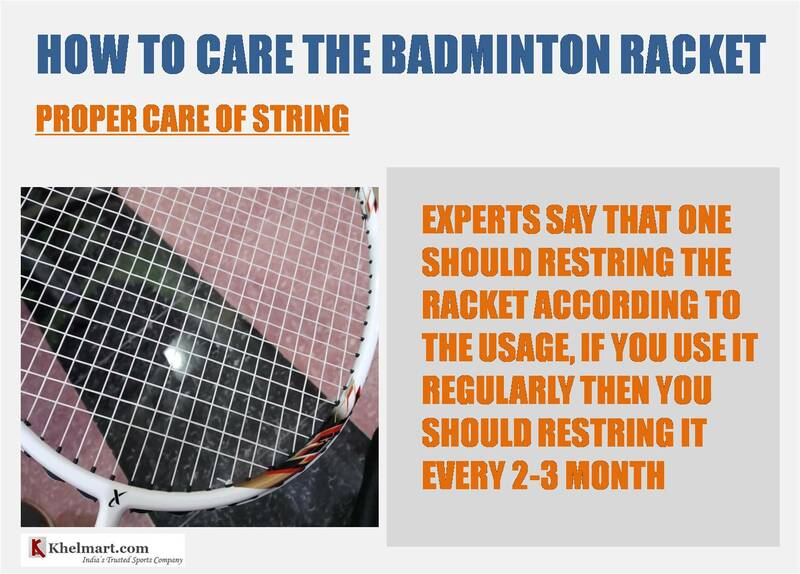 Another important point is that how regularly you restring the racket? As the string gets loose after a certain period of time. 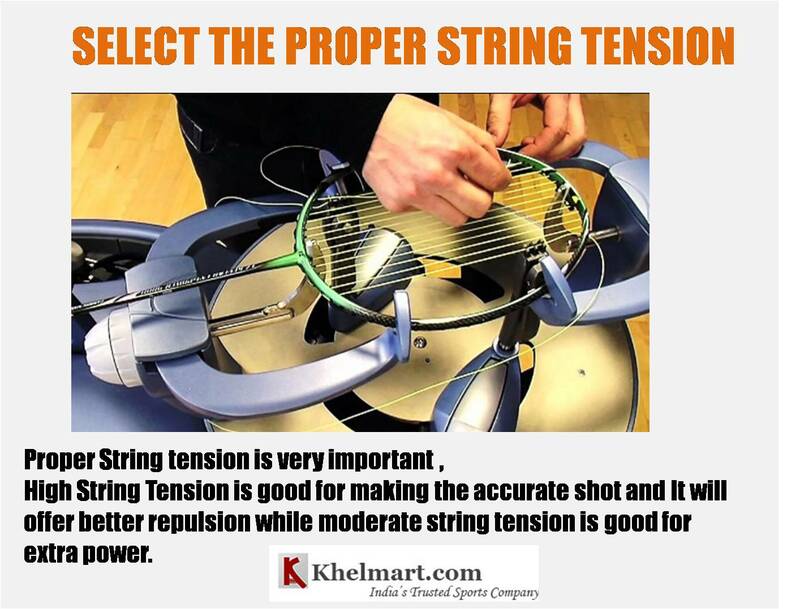 Experts say that one should restring the racket according to the usage, if you use it regularly then you should restring it every second week. But it also depends on your playing conditions, style, intensity, etc as well. 2) Do not forget about the grommets- Grommets give security to the strings, else the string would press itself against the frame. An easy miss-hit can result in critical pressure being put on a string, pushes in the frame, which might break the strings or loosen them. By replacing the broken grommets in time increases the life of the strings and frame . A complete grommet replacement takes up to 15-30 minutes. If you are a professional player you must understand how critical it is and it takes a lot of time and expertise to repair it. Well, it is not always difficult to repair it, the old rackets specifically with the hollow metal head can at times also take 1 hour to complete the job. There are few grommets which require specific size or strips and its price depends on its availability, so you should always have these gears in advance to avoid any problems when there is a tournament. 3) Store it carefully- The way you keep your racket has a great impact on how would it last. If it is not kept or sheltered in the right manner, its durability reduces. You should never leave your racket in the casual backpack with other gears and clothes as it would not do much good to your racket. If you leave your racket in a damp place it would have a negative impact on our racket. You should always try and store your racket in a cushioned bag. You should buy a good badminton bag which would provide great support and cushion to your racket. In case you live at a place where the temperature is really high or you are travelling to any such place, in that case, you should go for a thermal lined bag to shield your racket and strings from any damage. 4) Avoid heat as much as you can- It is always recommended to keep your racket in a dry, cool place and put it away from any type of direct or indirect heat if possible. Not all, of the players, would place the rackets at a hot place, in touch with the direct heat. But there are many players who tend to leave badminton rackets in the car or at any hot surface before leaving. On a bright sunny day, cars usually heat up and which in turn heats up your racket as well. Usually, the rackets are constructed by using carbon, and when the racket gets heat, carbon molecules in the racket drift to get out of shape and gets pulled because of the string tension. This can acutely damage your racket and reduce the durability of it. 5) Grip- Grip plays a major role while playing badminton, it does not matter whether you are a professional player or you are playing the game for fun. You should never ignore the fitting of the grip. If the grip does not meet your standards, you should change it instantaneously. There are numerous types of grips available in the market these days to suit the requirements of players. Select the one which fits your needs and switch in a few weeks. In case you are playing badminton in humid conditions or you have sweating issues, then you should ensure that you change the grip on a regular basis. If the grip is humid it becomes a nurturing ground for bacteria which can lead to infection. Sweat can also damage the wooden handle of your racket which tends to lessen its life span. So, it is important to keep the grip of the racket clean and should change it on a regular basis. You should opt for perfect badminton racket as they provide the best grip which absorbs the sweat easily. 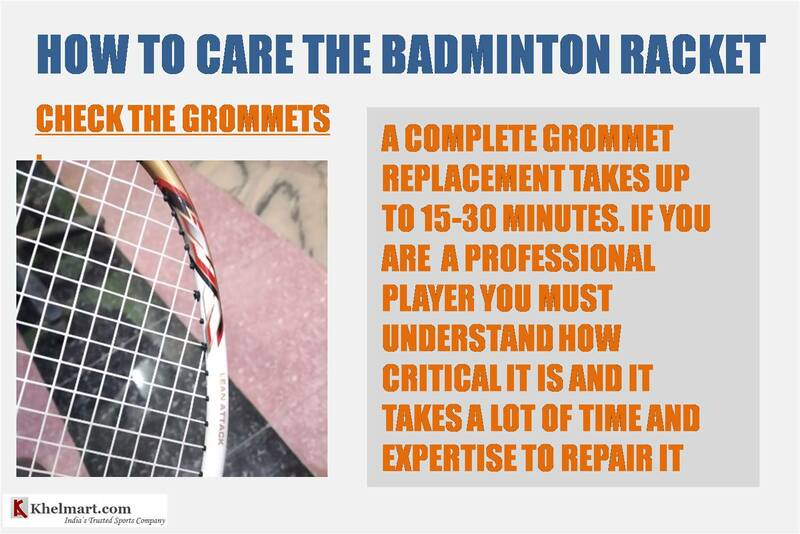 6) Frames- Players usually say that frame of the badminton racket is the portions where most of the damage occurs. Normally, you would find paint chips on the frame because of moisture or sweat or at times the heat as well. Even though paints chips do not affect the rackets in any way, but it does not look pleasant when you look at the racket particularly if you have more than a single chip on the frame. Paint chips generally happen when the racket clashes or if there any sort of crash on the frame. Well, there is nothing to worry about as paint chips are not a serious problem but are more of an aesthetic element. So you should make sure that there is no direct contact with heat or water to avoid it, as it makes the life shorter of the racket. 7) Cracks on the frame - One thing that a player should check out for is the cracks that come on the frame of the racket. These are very serious and normally reduce the rackets lifespan. Cracks are seen where there is paint chipping off because if its impact on the frame is intense enough to generate a crack, the paint would for sure come off too. You can recognize a crack on the frame of the racket as a sleek black line that is pretty much noticeable as the racket frame would look grey as the paint comes off. The intensity of the crack also depends on the depth and size of the crack. If severe enough, the frame would collapse and deform because of the tension in the strings which would act as a weakened spot upon the frame. 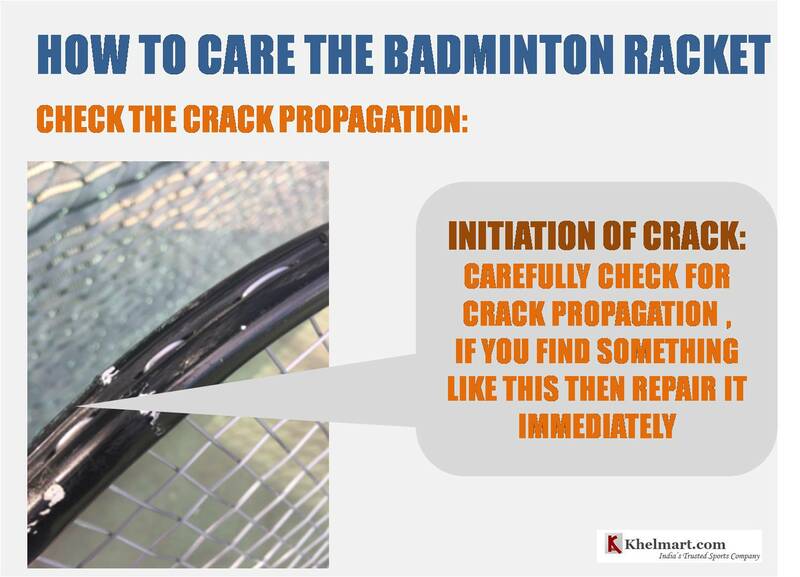 Once you observe a crack on your racket frame, you might be able to string your racket only a few more times and at a lower tension, else it might break. So you should be careful enough and if you see a crack on the racket get it repaired immediately. •	Clean your racket on a regular basis and treat it like your prized possession. Your work dose not just end up by purchasing an expensive badminton racket. You must make sure that the racket you bought is in perfect shape. Always tray and shelter it from damage, keep the moisture free and do not forget regular maintenance of it so that it lasts longer. If you take the required steps for protecting the badminton racket, you would be able to make use of it for a longer time. Taking care of your Badminton Shoes jogging, playing, exercising, or running is essential. Whatever fabric your shoe is made up of, no matter how much expensive and good quality shoe that is, but if you will not maintain and clean your shoes timely, it will collect dirt and hence it will get impacted in a negative way. Therefore it is imperative to keep your shoes immaculate just after it is used and exposed to dirt. Frequent cleaning shoes not only make your shoes look attractive but also showcase your personality as well. There is a well said saying A man is known by the shoes he wears. The difficult part of keeping the badminton shoes maintained is that these shoes are mostly white in color which keeps on getting dirty after playing even a single game or even if it will be worn for some time. Regular washing of white shoes is indispensable and cannot be avoided. After reading this blog you will get to have an idea about how to take good care of your badminton shoes. Some players use running shoes while playing badminton which is absolutely wrong as running shoes do not give you that extra support while moving in a badminton court. Basically, non-marking shoes are mostly used for indoor sports like basketball or badminton. The reason behind its use is that these shoes have a softer outer sole as compared to the other shoes. The rubber of these shoes is so soft that it does not leave scuff makes on the floor and gives you enough resistance for the perfect gripping. Some people think it a waste of money, but investing in these things is equally crucial as it is investing in your badminton shoes. Clean wipe and magic eraser have very effective results and are easily available online on many websites such as Amazon. It actually removes the stains, spots, and blemishes from your shoes in a great way. Apart from this stuff, you can also use washrag. Just make sure that you dont use it with water. You need to dip it in vinegar and then apply it to the stains. It also has terrific results. It may not sound sense to you but it really works. It even works very well on your white sneakers which have scratches and prominent marks. On white sneakers, you just need to apply the white nail polish. Likewise, whatever color your shoes are off, the same color nail polish needs to be applied. Just a little touch is required to clear off that smudge which you could see on the shoe. Mostly badminton shoes are white and white laces collects dirt very easily. Cleaning your laces regularly is needed otherwise your shoes will look very dull and pathetic. 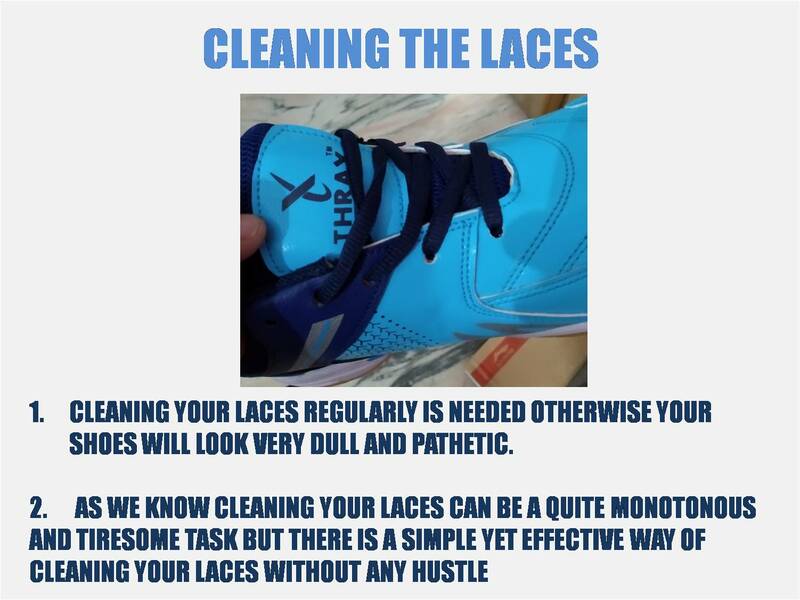 As we know cleaning your laces can be a quite monotonous and tiresome task but there is a simple yet effective way of cleaning your laces without any hustle. You just need to boil some water. Till the time you see bubbles and it gets boiled, do not switch off the gas. Keep the water as it is for 2 minutes. Let it evaporate a bit. Then put your laces inside that water and take it out after 5-6 minutes. You will see much difference and your laces will become brand new. Many people are used to cleaning their shoes by a piece of cloth or some other cleansing materials like old socks. Using this kind of stuff wont clean the shoes pretty well as a piece of cloth is not able to reach some areas of your shoes. It will definitely leave certain places which remains dirty. The best way to clean those places is to start using the toothbrush. 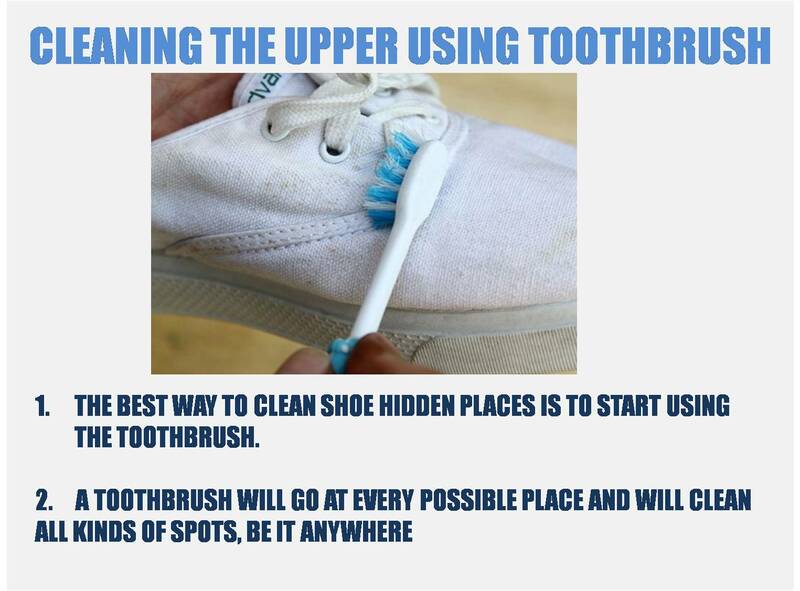 A toothbrush will go at every possible place and will clean all kinds of spots, be it anywhere. You need to dip a toothbrush in lukewarm soapy water and rub it gently with the toothbrush on the spots or the dirt. You will see the difference as all kinds of spots will vanish. In case your shoes have got some stains of oil, it is the best way to get rid of them. You or anyone else may unintentionally drop some oily stuff or it may happen accidentally, but now you have a remedy and you dont need to panic. You only need to apply some shampoo with your fingers at the dirt or over the spots, or over the oil stains. You may even scrub your toothbrush on the shampoo for the best results. This will give a charming new look for your shoes again. When you have just started playing badminton (beginner) or even if you are an intermediate player, one of the most important aspects to keep in mind for court shoes is about shoe grips which are ignored by many players and especially by intermediate players. Most of the times they lose their shoe grip after wearing it a couple of times. 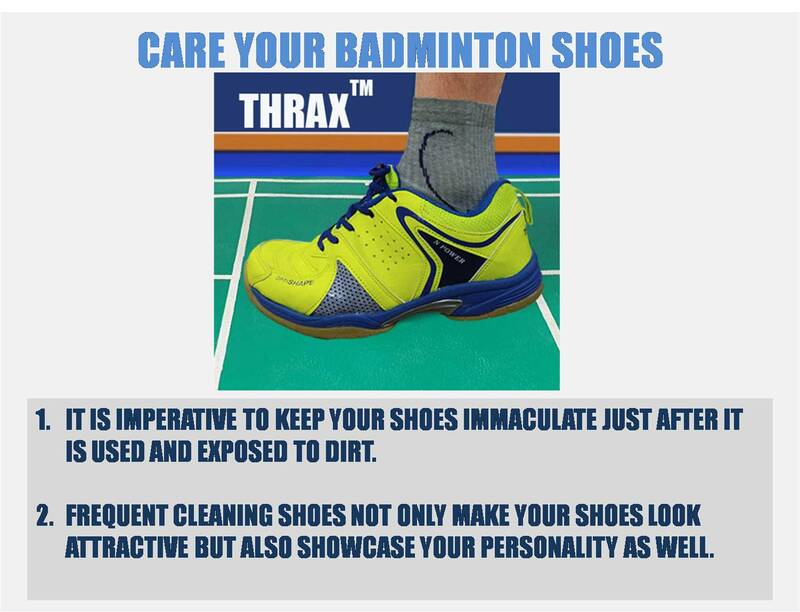 This article will make you cognizant about how to improve or maintain the shoe grip of your badminton or any other sports shoes. c) Using your badminton shoes for other purposes like running, exercising or workout, or maybe for any other thing. These shoes have a soft soul which should be used only while playing any indoor sport. a) First, you need to remove the dirt from the sole with a dry toothbrush or some other brush. b) Then you need to wipe your shoe with a wet piece of cotton cloth. c) After wiping it from a cloth, you need a toothbrush for deep cleaning. d) Before applying a toothbrush, apply some shampoo or soap in the sole of the shoe. e) Then dip that brush into hot water. f) Rub that toothbrush smoothly on to the sole. 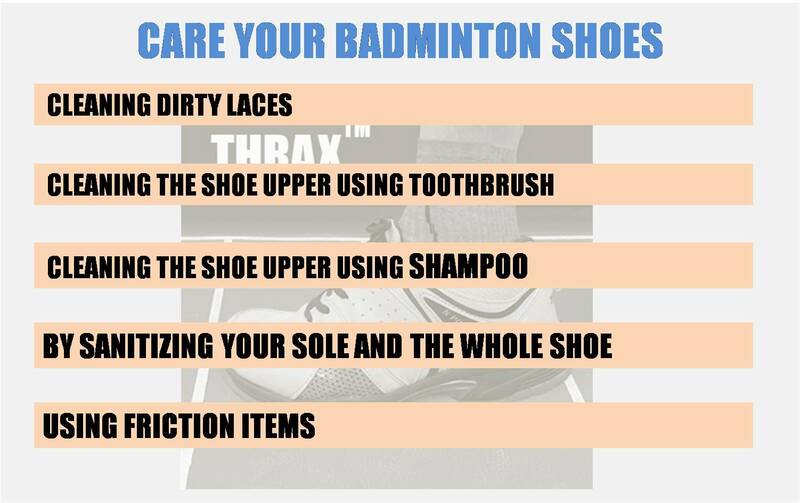 You can perform the same process not just for the cleansing of the sole but also to sanitize your whole badminton shoe. This process will undoubtedly enhance the shoe grip and when you play on the court after getting your shoe going through this process , you will see the difference. This trick is not much effective for synthetic court but if you are playing on a marble or a wooden court, nothing can beat this method of increasing your grip of the shoe on court. It works by making it less slippery and by providing much stability. This is what you need to do to have the better gripping of shoes. Apart from using the mixture, you can also use some powder which some players use on their hands in order to avoid slipping, which further improves the gripping of their racket. The same way you can apply some powder on the court to improve the traction on the court which will lead to an increase in the court friction. Mostly badminton shoes are lightweight for faster feet movement. They also have little lateral support. Badminton shoes are just like an asset which is not bought every now and then. Therefore, badminton shoes need to be taken good care of.